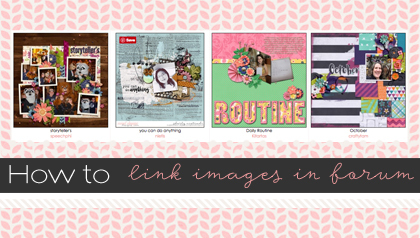 Posted by Sweet Shoppe Designs under Getting Started, New To Digiscrapping? Hello digiscrappers! 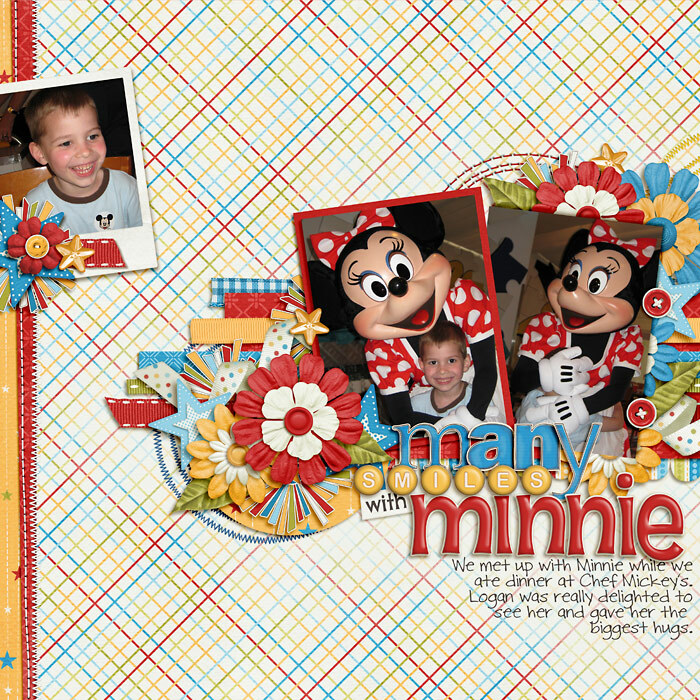 This is Julie Billingsley, and I will be walking you through a layout so you can learn to scrapbook on your computer. This tutorial is a general guide to get you started with digiscrapping if you are a beginner or an experienced digiscrapper that is changing programs. When you are a beginner, going from a blank canvas to a finished layout can be a daunting task. This tutorial will give you the guidance to make your first layout and develop skills that will keep you scrapping! I will be using Photoshop Elements 10 (PSE) and Photoshop CS5 (PSCS), you do not need both programs but I’m using both so that no matter which you are using, you can follow along. 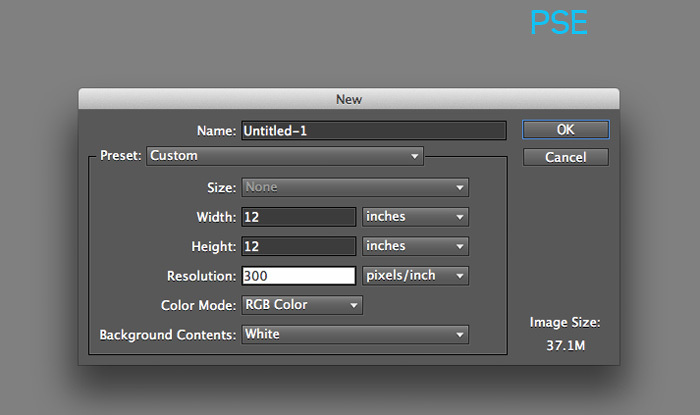 Even if you have an older version of PSE or PSCS, you should be able to use this tutorial. I will be using a Mac computer, so things might look a little bit different if you are on a PC. Please note, if the directions for both programs are identical, only one screenshot may be shown. 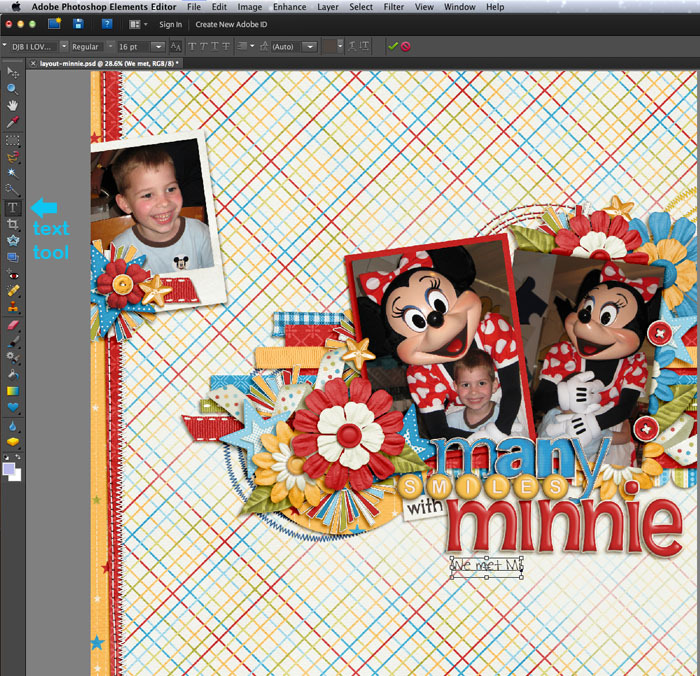 This the finished layout that I will be creating as I walk you through making a layout. 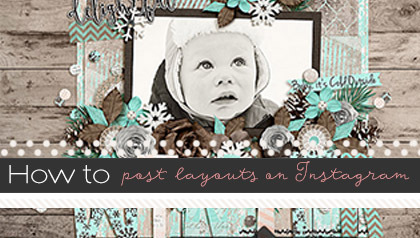 Your layout style might be different than mine, with more embellishment or less. If you are familiar with Adobe products, you have probably realized there are often several ways to achieve the same results. 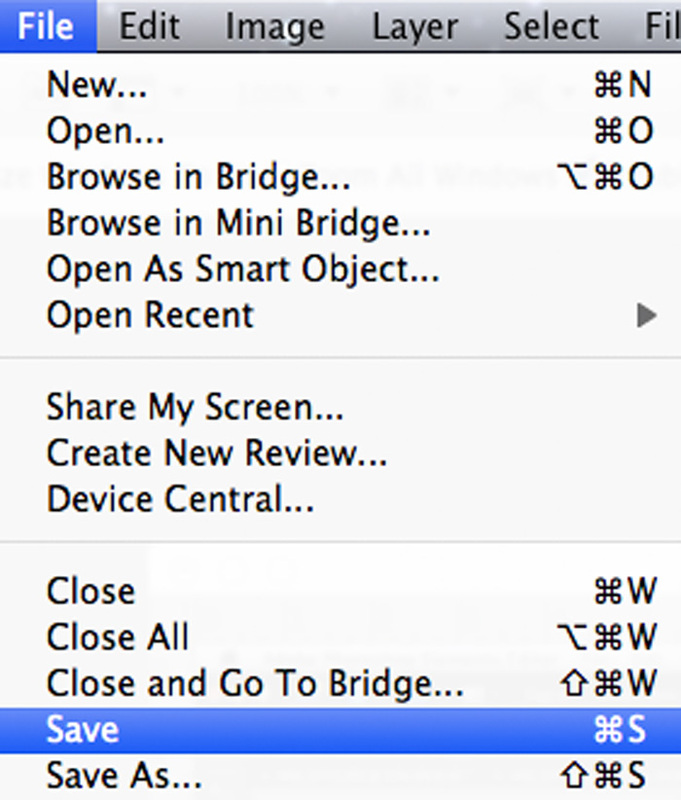 One digiscrapper could use the keyboard shortcuts for doing a step, and another digiscrapper could use the toolbar to achieve that same step. Please check out the in-depth tutorials in the Sweet Shoppe website to learn more about different techniques. 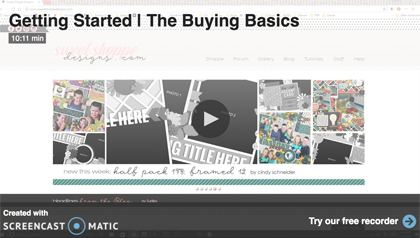 Let’s get started by reviewing what you will need for a layout. 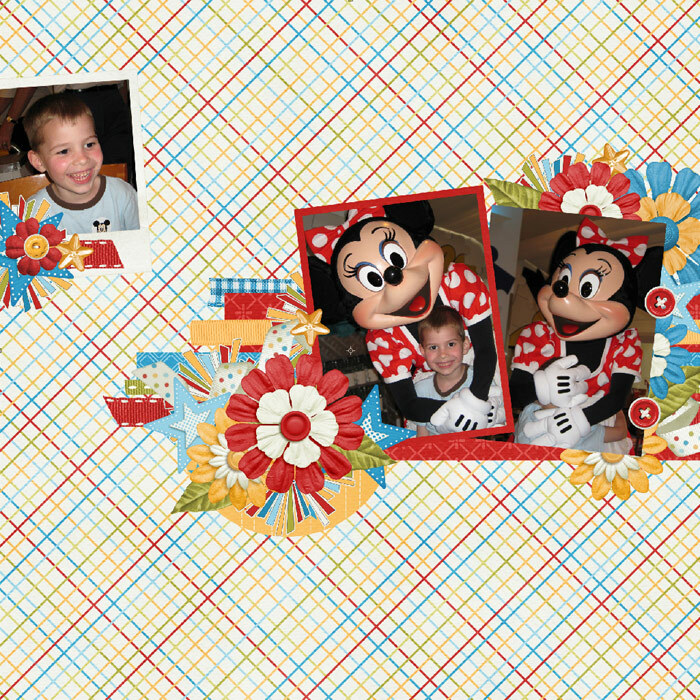 You will need photos on your computer, a digital scrapbooking kit of your choice, and a graphics software program. 1. Open Photoshop Elements or Photoshop CS. 2. Create a new file. 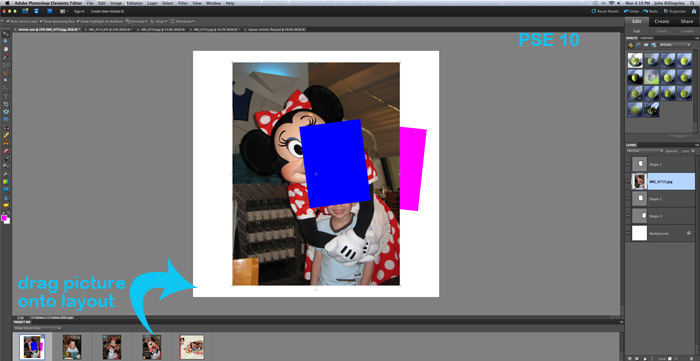 Do this in PSE by going to File-New-Blank File. Do this in PSCS by going to File-New. 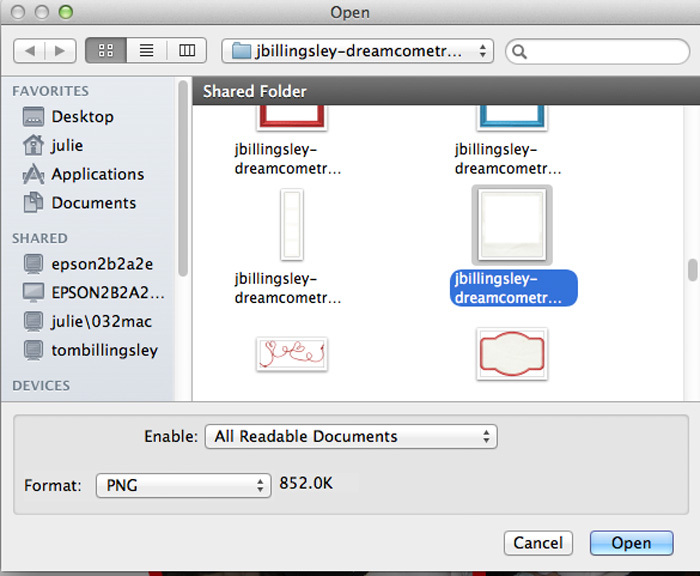 This will open a pop-up box for your dimensions and resolution for this new file. The standard size for a layout is 12”x12” at 300 pixels/inch resolution. 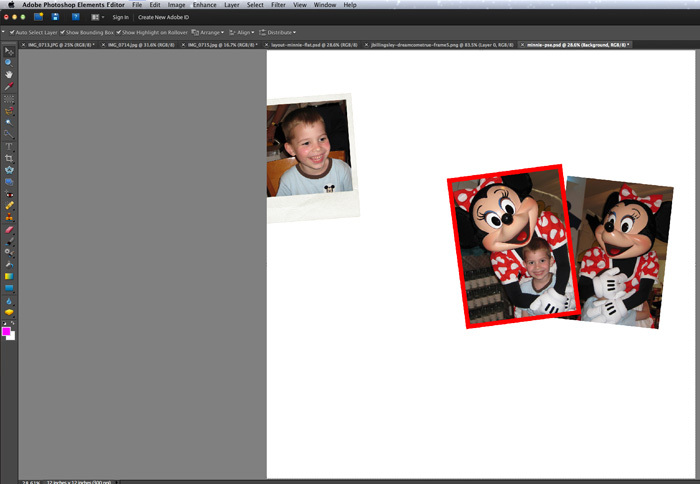 Some people also scrapbook in the 8 1/2”x11” at 300 pixels/inch size. Even if later you choose to print the layout in a smaller size, I recommend scrapbooking in this size. This is what your work area will look like. Remember, I am on a Mac, so if you are on a PC, your screen could look a little different. 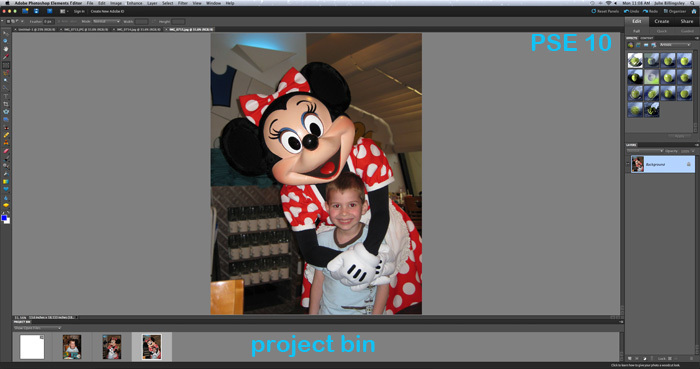 In Photoshop Elements, the project bin is at the bottom and that is where all your open files will go. You will see I have my newly opened file in the main work space and it’s also showing in the project bin. 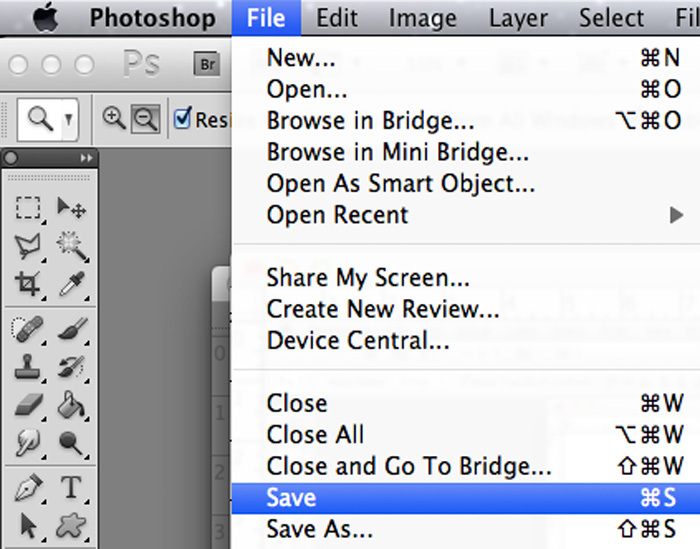 In Photoshop CS5, there is not a project bin. There are a few ways to arrange your files. Go to Window-Arrange-Float All in Windows if you want your screen to look like mine, if you are using PS CS5. That is my favorite way. Others like to have every file consolidated to a tab. 3. Open the photos you want to use for this layout. Do this by going to File-Open and selecting the files you want. I’ve chosen three pictures from a vacation. This is what your work area will look like now. 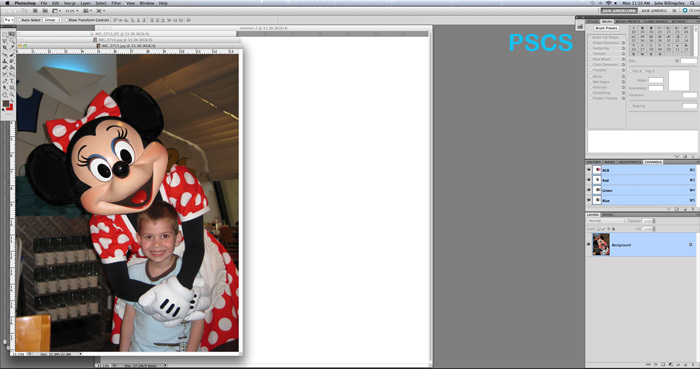 In PSE, the photos and the blank layout are in the project bin, with the newest opened file also in the work space. 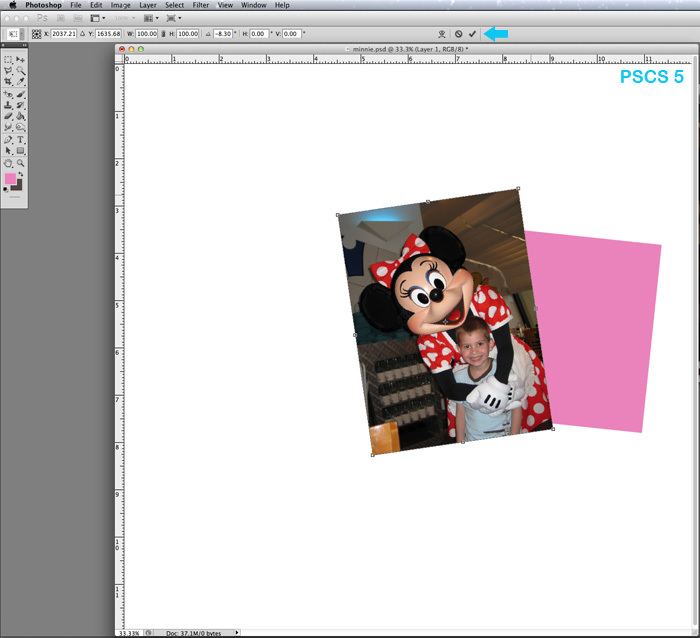 In PSCS, all the photos and the blank layout are cascading over the work space. 4. Edit the photos. See our tutorials for other ways to edit and enhance your photos. 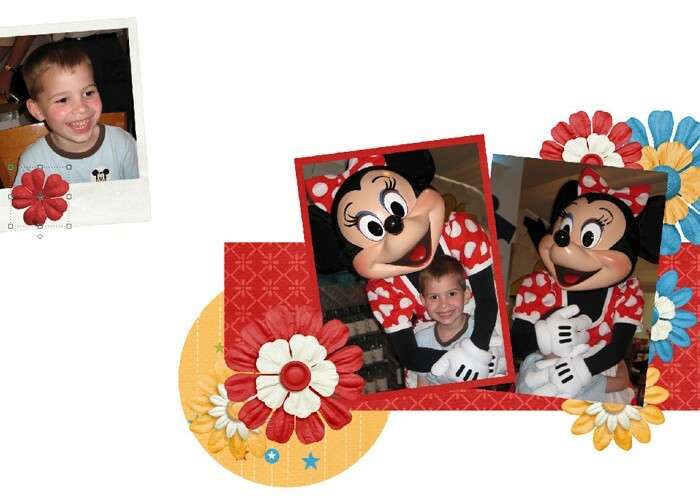 For my photos, I need to edit the red eyes of my son. Zoom in closer to the eye by using the Magnifying Glass tool. Click on the Magnifying Glass and select the + for zoom in, the – for zoom out. Click on the photo and it will zoom in so you can see the eyes clearly. Select the Red Eye Tool. Click each eye and it will remove the red eyes. 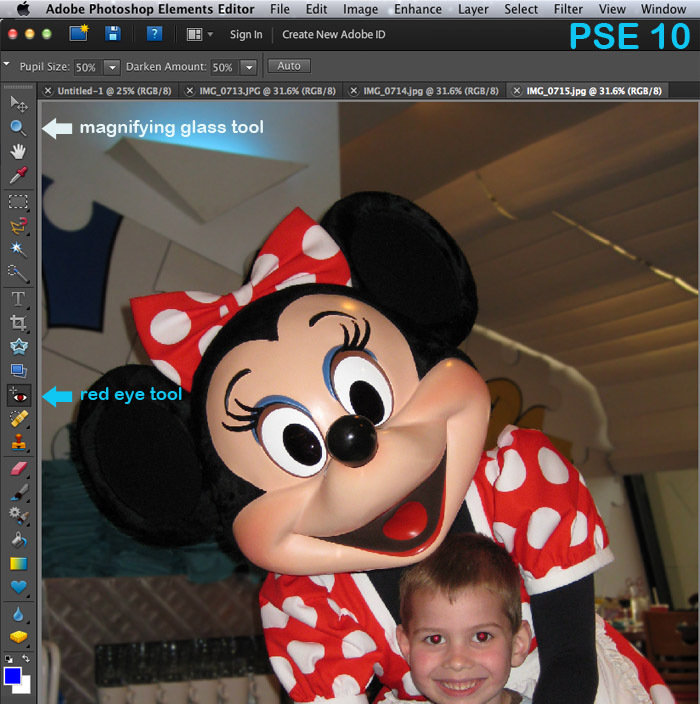 In PSE, the Red Eye Tool looks like this. 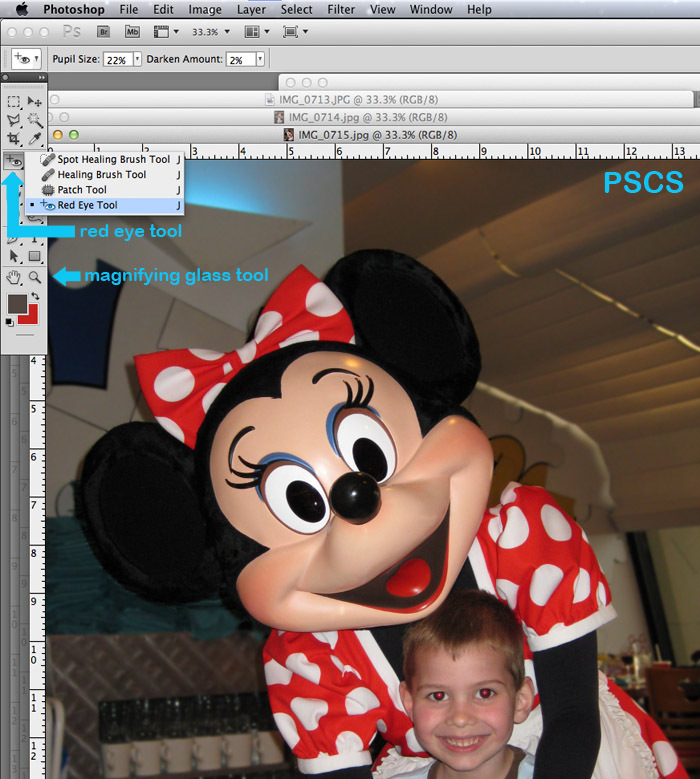 In PSCS, the red eye tool shares space with the Healing Brush Tool, so if you do not see an eye in your tools palette, then look for the bandaid. There is a small arrow at the bottom of the tool button, hovering over the arrow will show you all the tools and you can select the Red Eye Tool. 5. Add a photo box to your blank layout. You could just drag the whole photo over to your layout, but I want to crop the photo into a certain size. 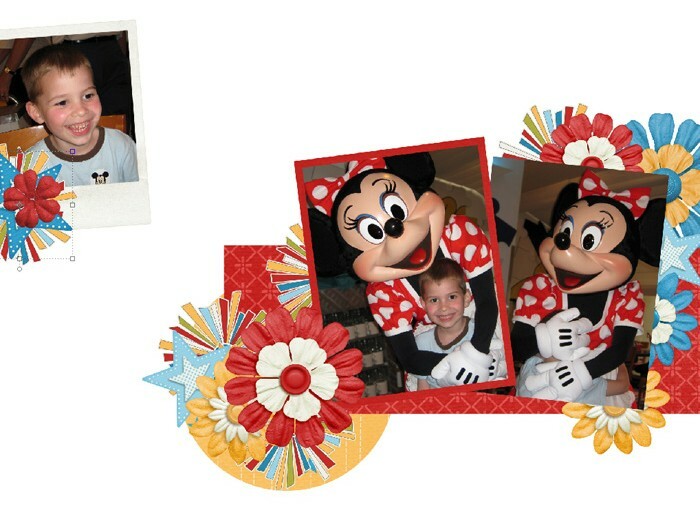 This is easily done with adding a photo box. 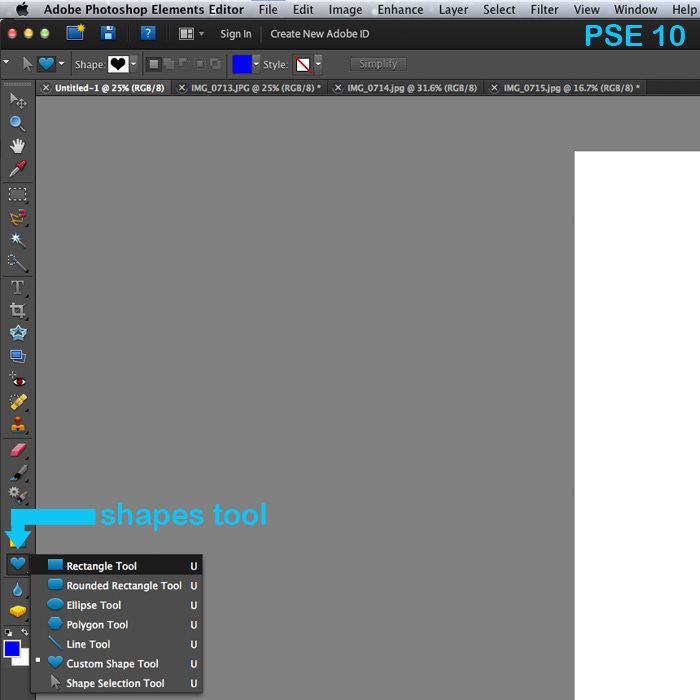 In PSE, select the pointer arrow tool and drag the blank document to the work space. Select the Shapes tool and click the rectangle. I want my photos to be a specific size, so in PSE go to the blue rectangle options drop down box on the left and click fixed size. Enter the size you want. I have entered 3”x4”. You can also choose the color of the rectangle, but the color doesn’t matter to me because it will be covered up. 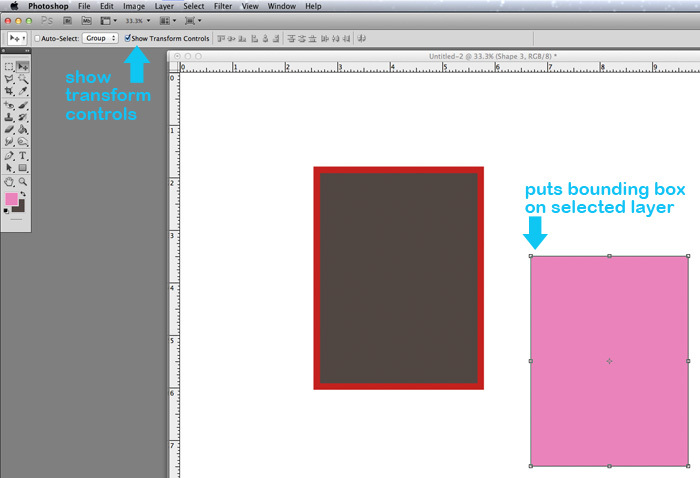 If you want to draw your own rectangle on the layout, just select unconstrained. I’ve entered the size I want, so just click the blank layout and it will appear. 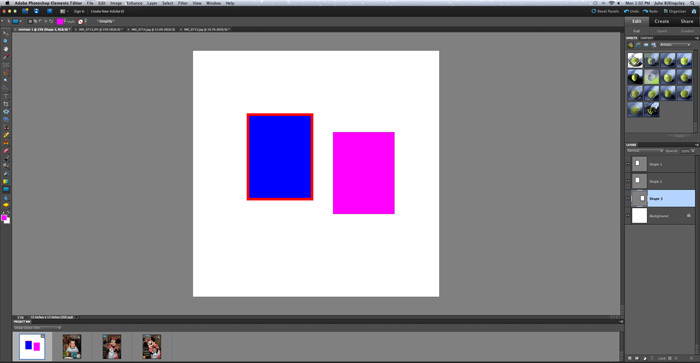 You will see the rectangle (which the program has named Shape 1) on the blank layout and you will see it in the layers palette on the right side of the screen. In PSCS, click the blank document to make it active and on top of the other files. Select the Shapes tool and click the rectangle. I want my photos to be a specific size, so in PSCS go to the drop down box arrow which is to the right of the blob shape. Click fixed size. Enter the size you want. I have entered 3”x4”. You can also choose the color of the rectangle, but the color doesn’t matter to me because it will be covered up. If you want to draw your own rectangle on the layout, just select unconstrained. I’ve entered the size I want, so just click the blank layout and it will appear. 6. 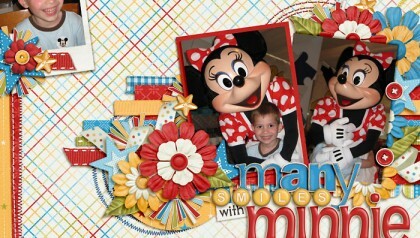 Add a mat to your photo. I want my photo to have a mat underneath it. If you are not using a frame around your photo, a mat will give your photo extra emphasis. 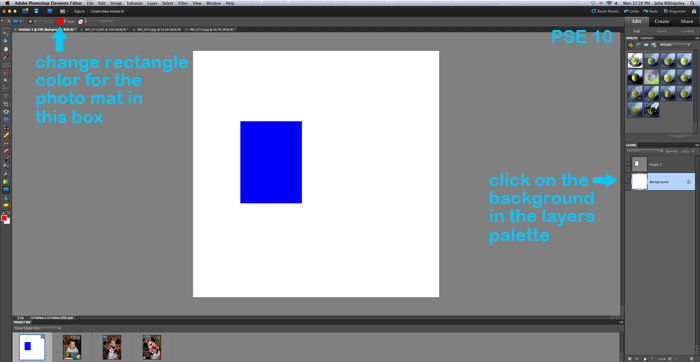 Before you add this box, click the background in the layers palette. This will place the new photo mat under the photo box when you make it. I will do the same technique as in Step 5, but I will make the size of the rectangle slightly larger by 1/4 inch by entering the fixed size 3.25”x4.25”. 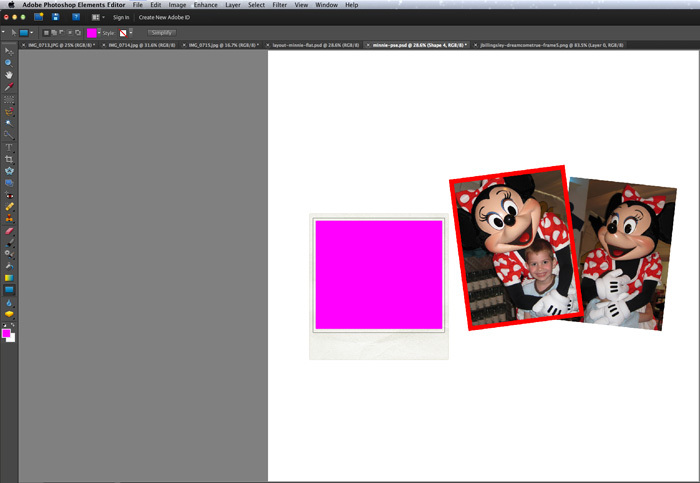 I am picking a new color for the rectangle, so it stands out from the photo box. 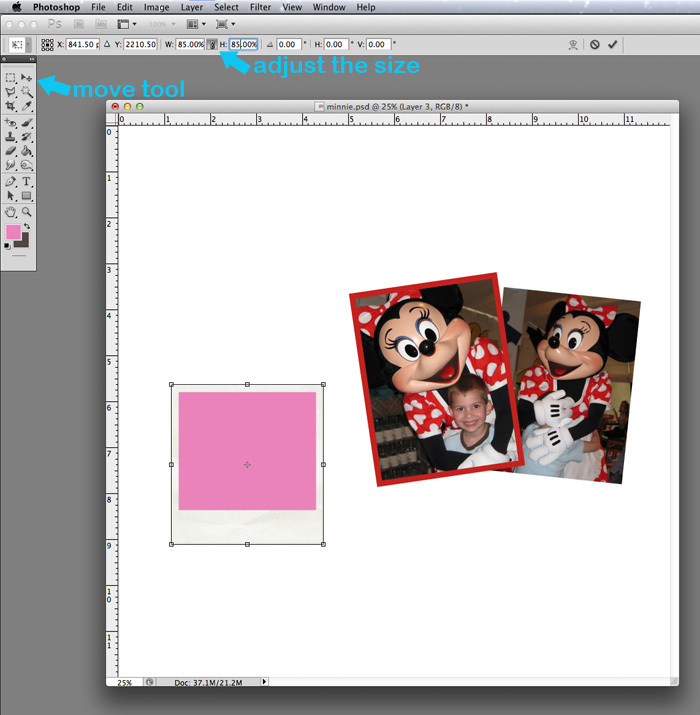 Follow the technique in Step 5, and once you’ve clicked the layout in the work space, you will see your second rectangle. 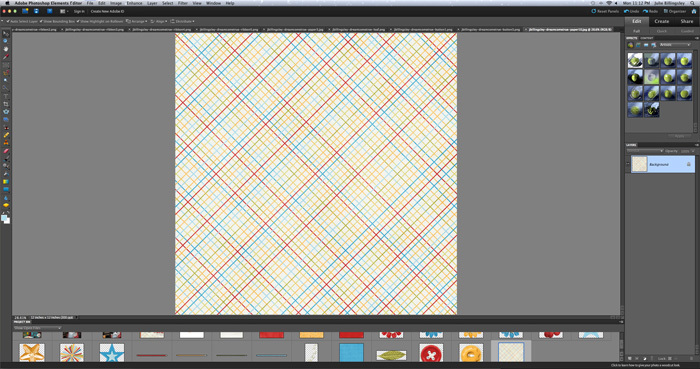 Please note this will not be your actual mat, it’s just a placeholder for the paper that will become the mat. 7. Align the rectangles. Currently the rectangles are out of place, just where I randomly clicked on the layout. I want them perfectly aligned with the photo box on top of the mat box. Select the Move Tool (also called Pointer Arrow tool). Select the two rectangle shapes in the layers palette by clicking one of them and then while holding down your keyboard’s Control key (Mac: Command key), and click the second one. Both will be highlighted in your layers palette. Be sure the Move Tool is selected in your tool bin, and you will see some align options near the top of your screen. In PSE, click Align to see the drop down box and click aline vertical centers. Then again click Align to see the drop down box and this time click aline horizontal centers. In PSCS, there are alignment tools just to the right of the words “Show Transform Controls.” Click the vertical center and then the horizontal center alinement button. You have a mat under your photo box now. 8. Link the photo box and the mat so they stay together. In the layers palette, have both the rectangles selected by clicking one of them and then while holding down your keyboard’s Control key (on a Mac it’s the Command key), click the second one. 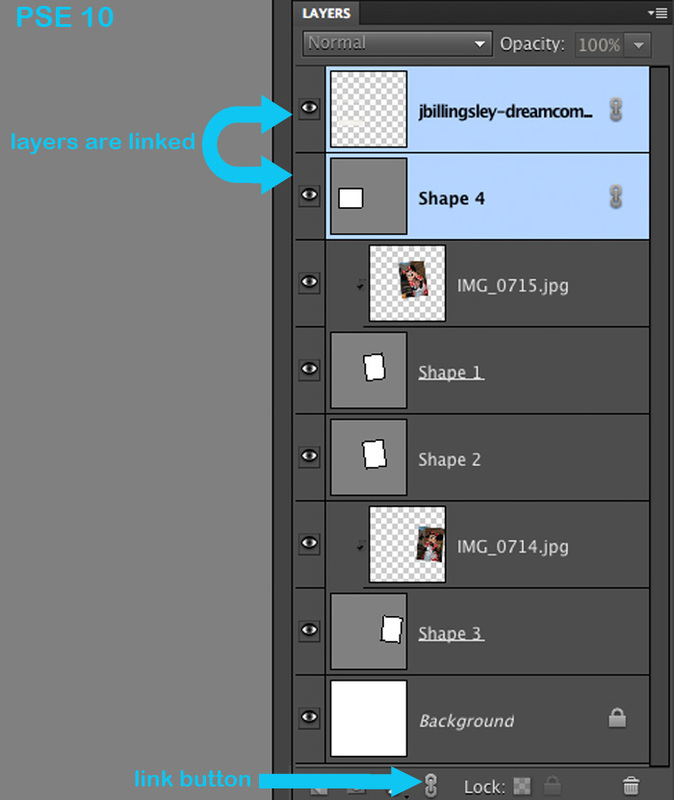 Then, click the Link button at the bottom of your layers palette. This makes the two rectangles move together. 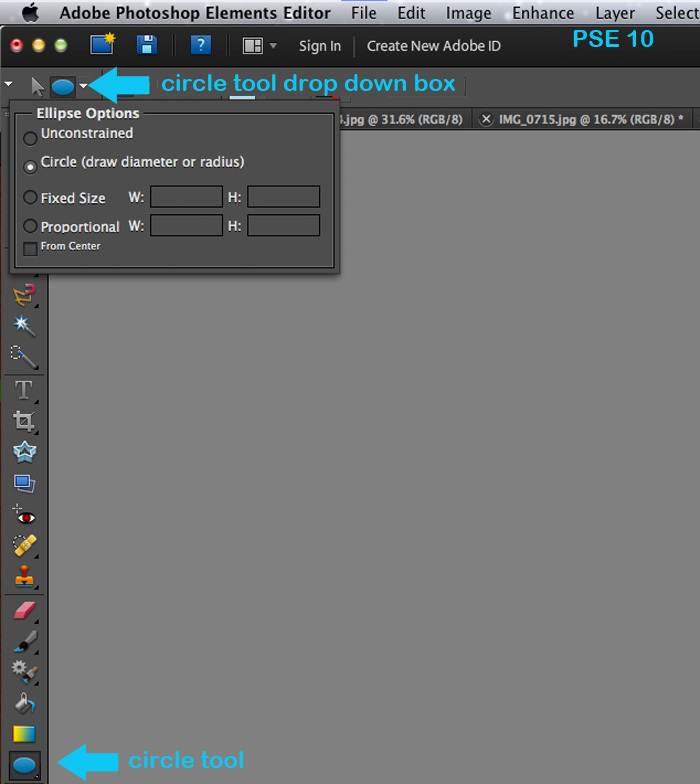 Click the background layer in your layers palette to continue. 9. 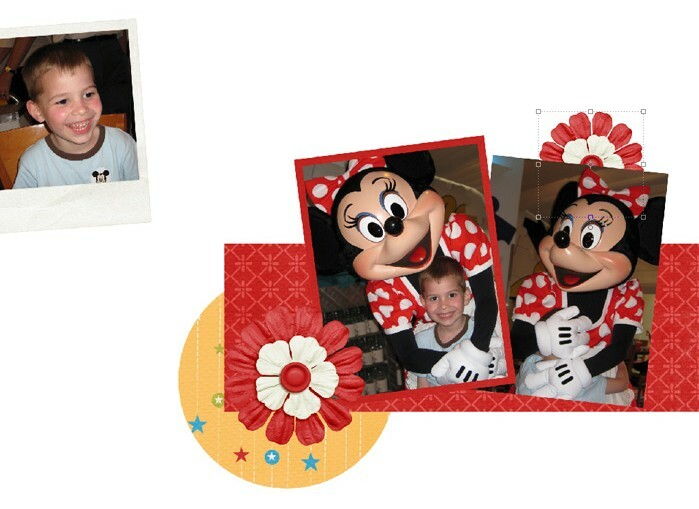 Add additional photo boxes by following Step 5. I’ve added another photo box in the 3×4” size. I have decided to not mat this one. 10. Arrange the photo boxes. 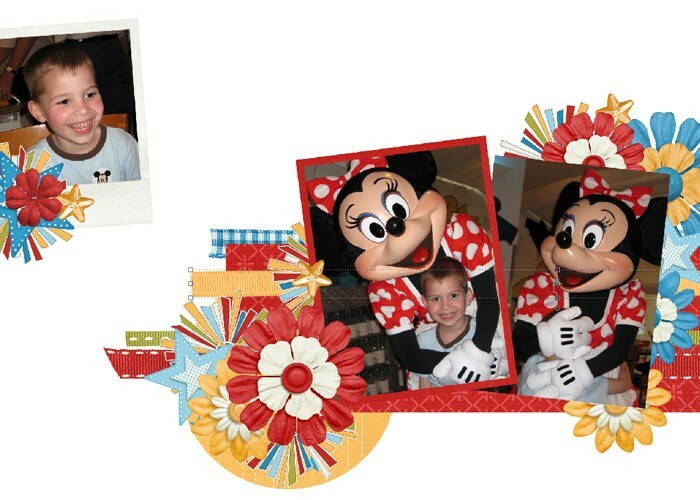 To arrange the photo boxes you will need to see the transformation controls. Select the Move Tool (Pointer Arrow) and check the box to see the transformation controls around the item that is selected in your layers palette. In PSE, be sure that “Show Bounding Box” is checked. In PSCS, be sure that “Show Transform Controls” is checked. 11. 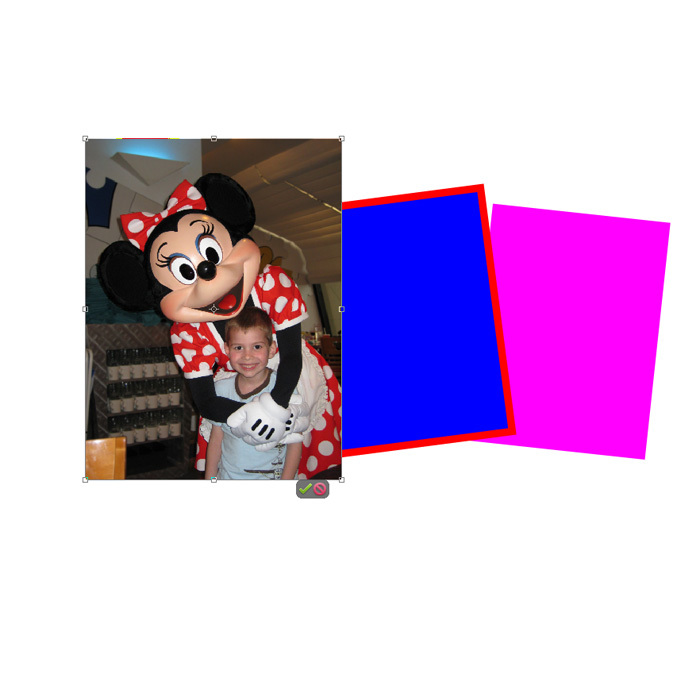 Drag the photo box to the area you want it by using the Move Tool and angle the photo box by hovering near one of the corners. You will see a little curved arrow and click your mouse there. In PSE, when you change the angle you will see a green checkmark and a red null sign. When you are happy with the angle, click the green checkmark and the bounding box will disappear. 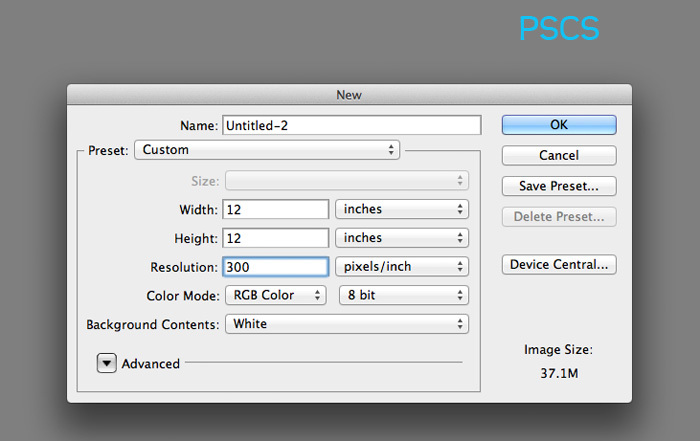 In PSCS, when you are done changing the angle, click the checkmark at the top of the screen. 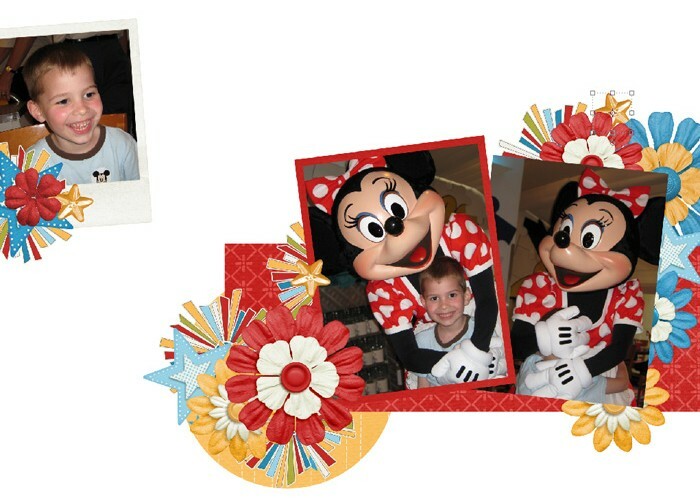 Angle and adjust each photo box to your liking. 12. Save your progress. Now that we have something going on with this layout, we need to save it. I recommend saving often because it’s quite frustrating to lose your progress because you didn’t save it. I’d save at least every 20 minutes or so. I recommend creating a specific folder on your hard drive for your layouts. To save your progress in either program, go to File-Save and then select your folder. 13. 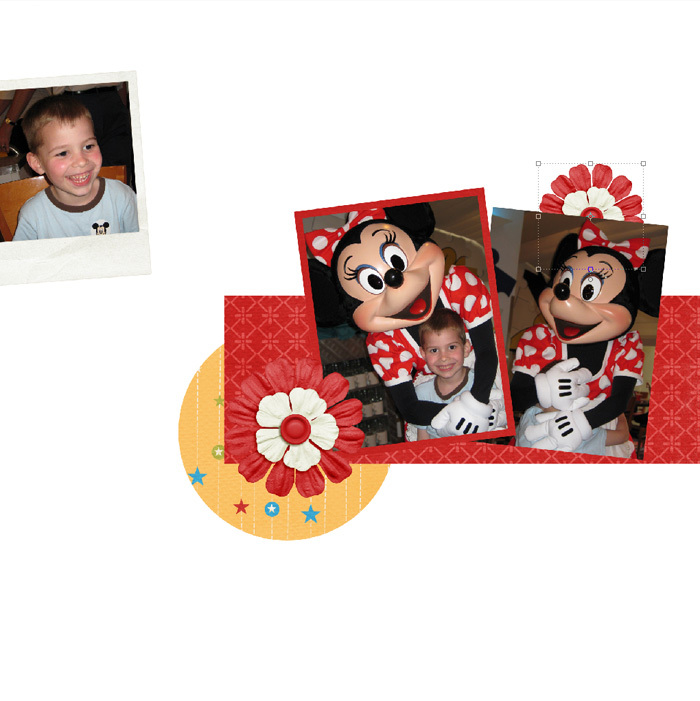 Drag a photo into the layout. 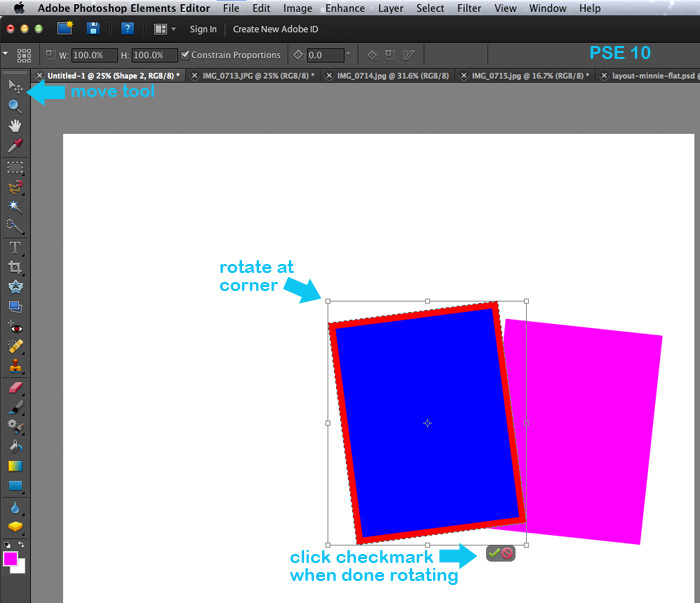 In PSE, you already have the layout in your main workspace, so take your mouse and click and drag (at the same time) the photo you want from the bottom project bin and put it on the layout. 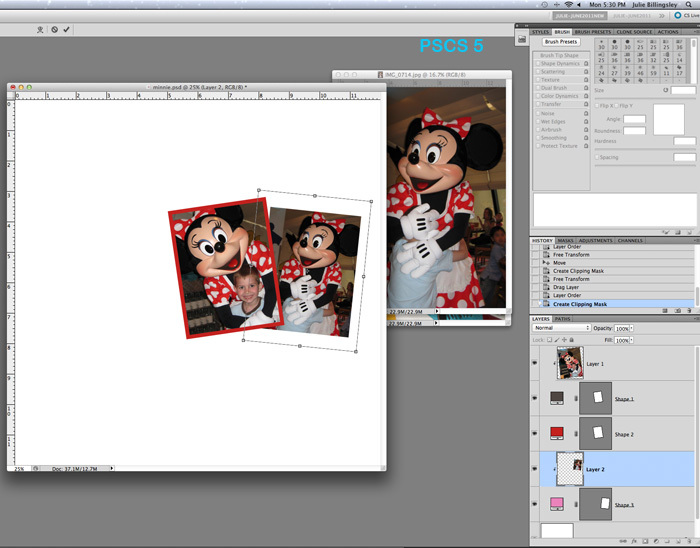 In PSCS, click and drag the photo from the workspace onto the layout. In my layout, the photo placed itself between some of the rectangles. This is not where I want it. 14. Move the photo to the correct position, if needed. My photo needs to be above the photo box (it’s blue in the PSE example, it’s gray in the PSCS example), so in the layers palette, I will click and drag it above the photo box layer (labeled Shape 1 in the layers palette). 15. 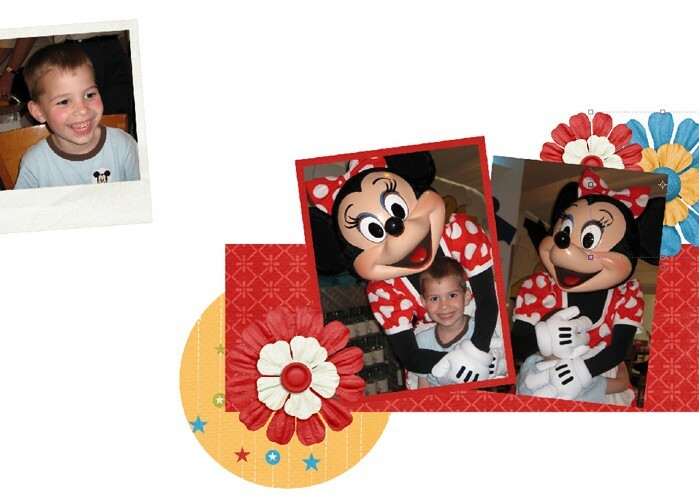 Resize photo to fit photo box. 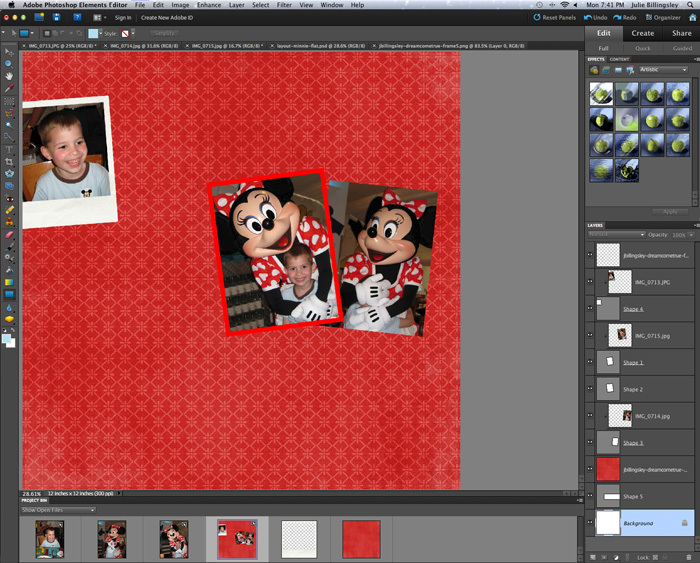 My photo is huge, too big for the layout that I have planned, so I will resize it down. There are transformation controls (also called the bounding box) on the photo, so we will resize it by going to one of the corners. You will see a little diagonal arrow. 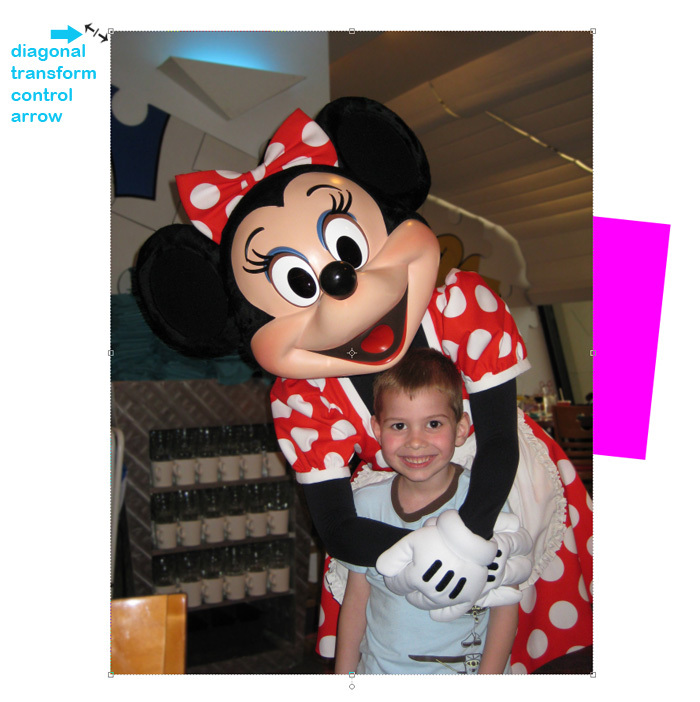 Click the corner of the photo at the little arrow to activate the transformation tool. 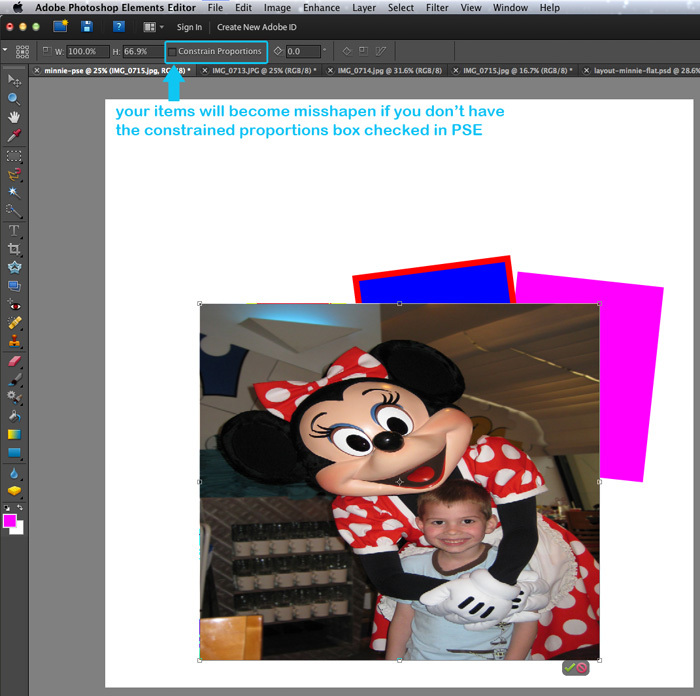 At the top bar of PSE, make sure the Constrain Proportions is clicked when you resize because that will keep your photo in proportion. Otherwise your photos will be misshaped and odd. In PSCS, be sure the link is clicked to keep your items in proportion. Resize the photo and click the checkmark to approve the resize. 16. Angle the photo to match the photo box. 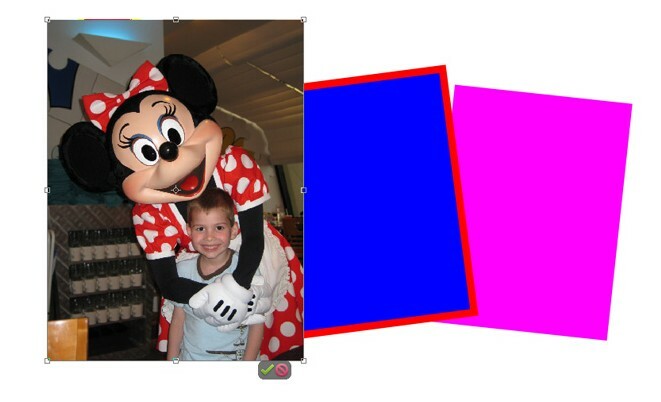 Using the Move Tool, you will angle the photo by hovering near one of the corners. You will see a little curved arrow and click your mouse there. In PSE, when you change the angle you will see a green checkmark and a red null sign. Try to match the angle of the photo to the photo box. Click the checkmark, and the bounding box will disappear. In PSCS, when you are done changing the angle, click the checkmark at the top of the screen. 17. 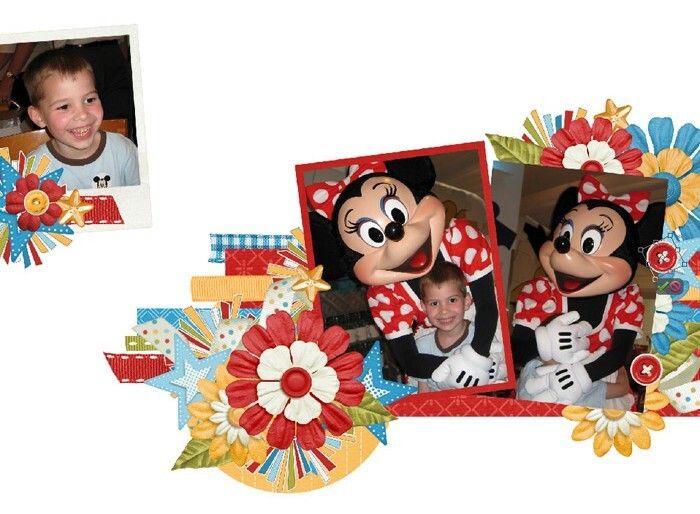 Clip the photo to the photo box. In PSE, press Control-G on your keyboard (Command-G on a Mac). In PSCS, to clip the photo press Control-Alt-G on your keyboard. (Option-Command-G on a Mac). 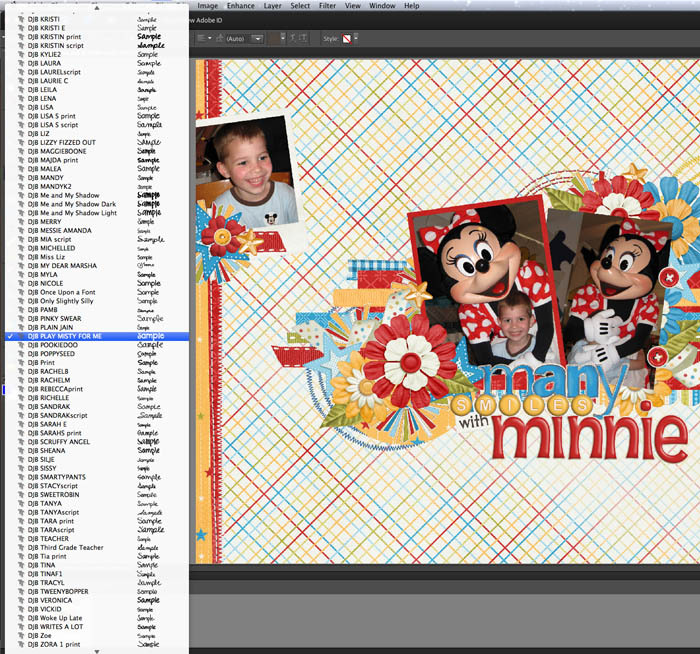 If you don’t like to use the keyboard shortcuts, you can go to Layer-Create Clipping Mask in either program. 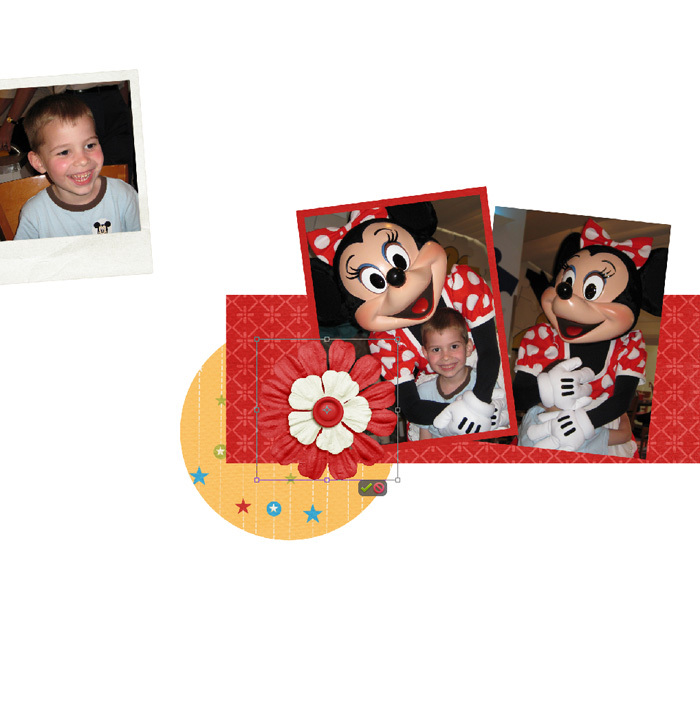 The photo is now clipped to the size of the photo box we created, this is called a clipping mask. You can move the photo around on the clipping mask until it’s in the position you want. 18. Clip the second photo to the other photo box. 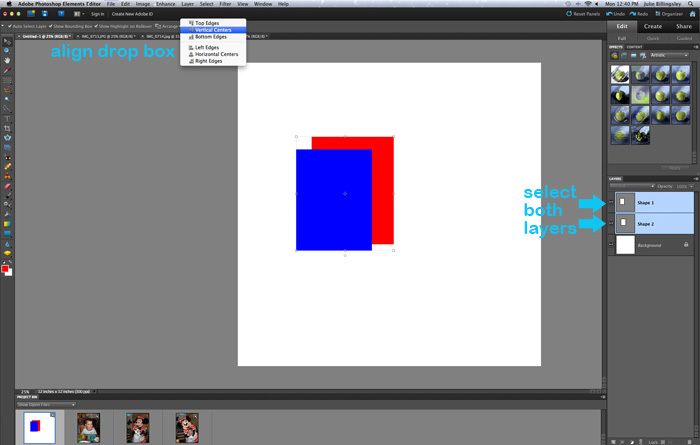 First select the photo box in your layers palette (it’s labeled Shape 3). Then follow Steps 13-17. 20. 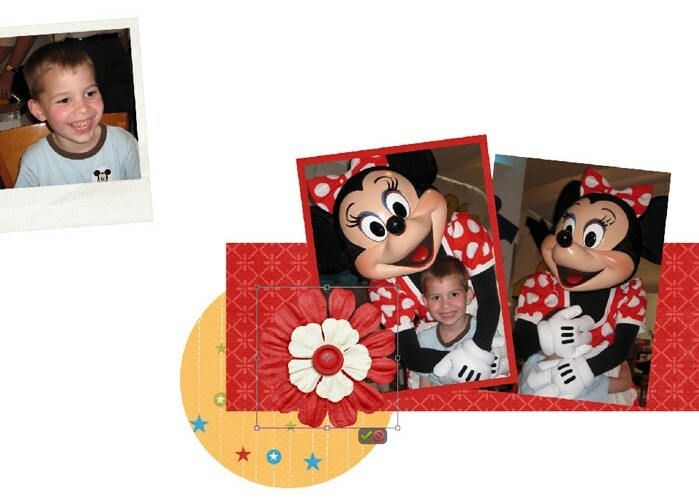 Add a photo frame for the third photo. 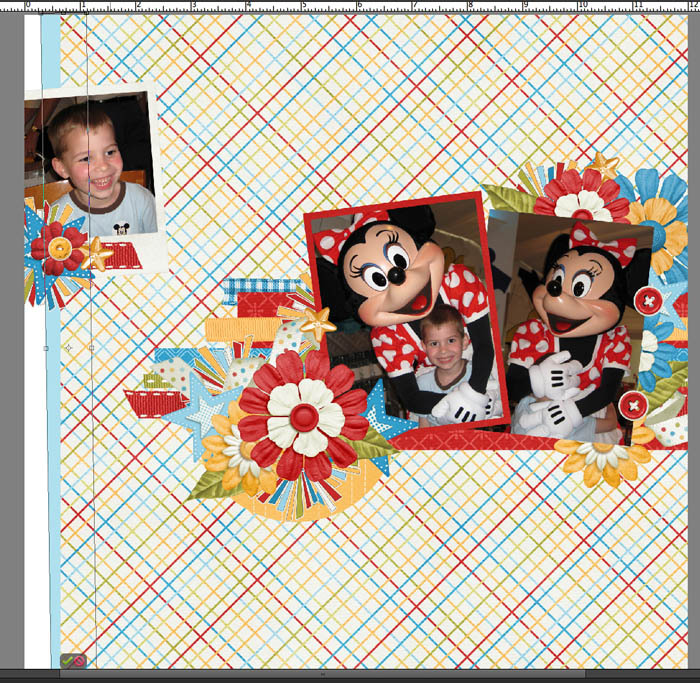 In your program, go to File-Open and then navigate to your digital scrapbooking kit. Select a frame and open it. 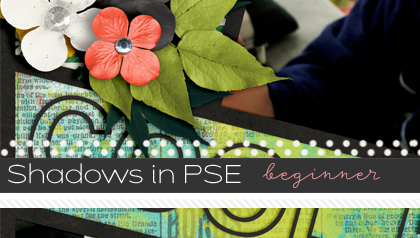 In PSE, the newly opened frame will be front and center in your workspace. 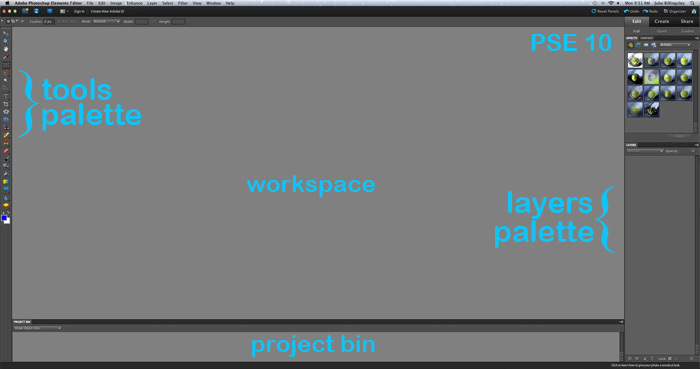 Select the layout from the bottom Project Bin and drag it onto the gray background so it is open in the workspace. 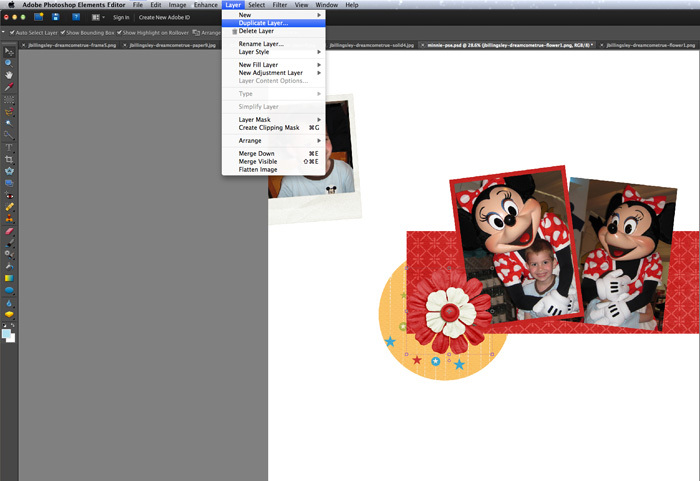 Then click and drag the frame from the bottom Project Bin onto the layout. 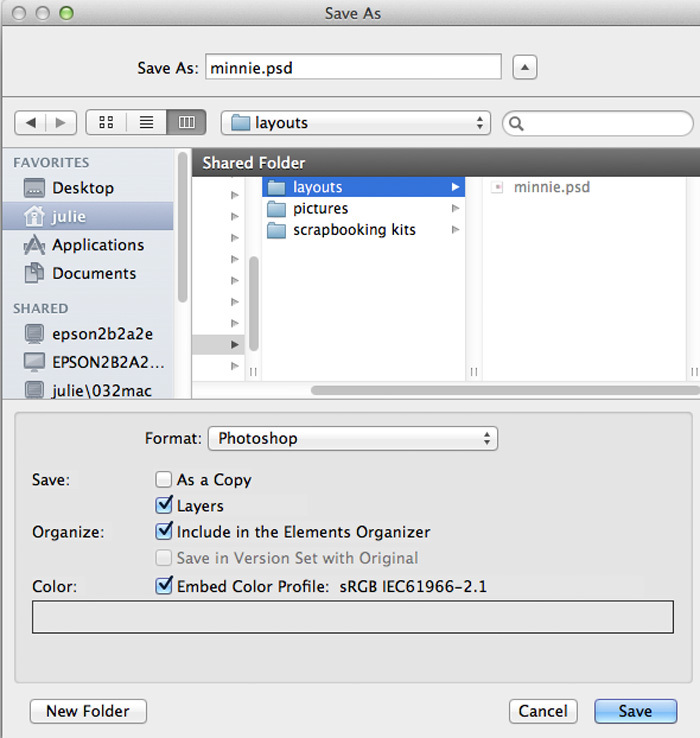 In PSCS, click the newly opened frame and drag it onto the layout. 21. Move the frame up in the layers palette by click and dragging it so it is the top item. 22. Add a clipping mask for the photo frame. 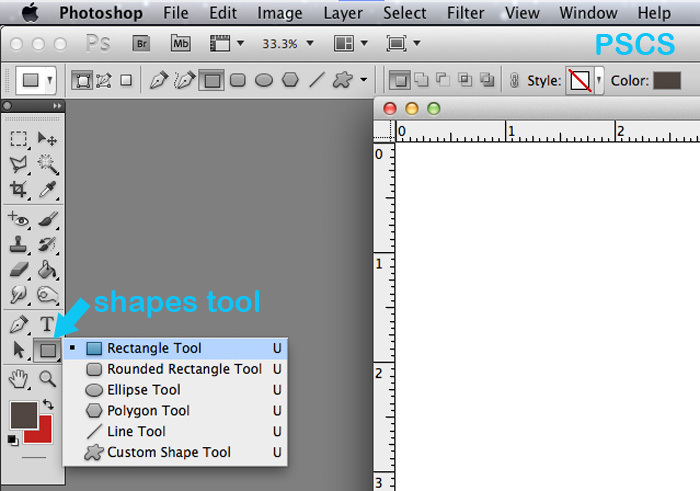 Select the Shapes tool, and click the rectangle. In PSE, go to the blue rectangle drop down box on the left and click unconstrained size. 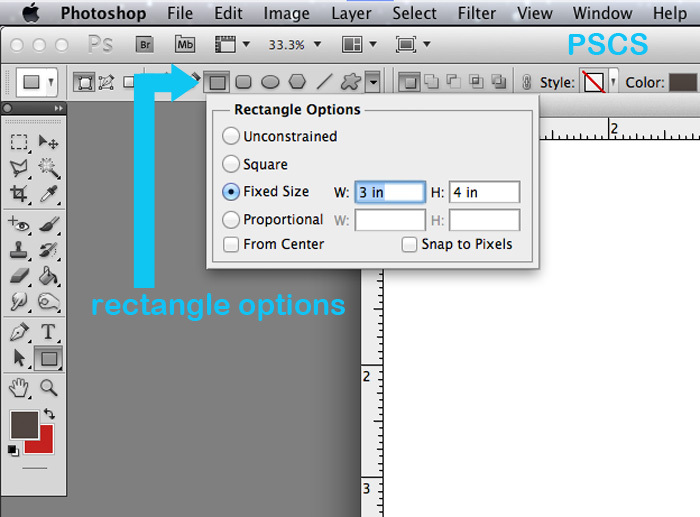 In PSCS go the drop down box arrow, which is to the right of the blob shape, and click unconstrained size. Place your mouse near the edge of the photo opening in the frame. You will click and drag a box diagonally that will cover the photo hole but that is not so big that it is larger than the frame. If you need to try again because the size isn’t correct, press Control-Z on a PC to undo your last action. On a Mac, press Command-Z to undo your last action. 23. Move the photo mask rectangle under the frame. 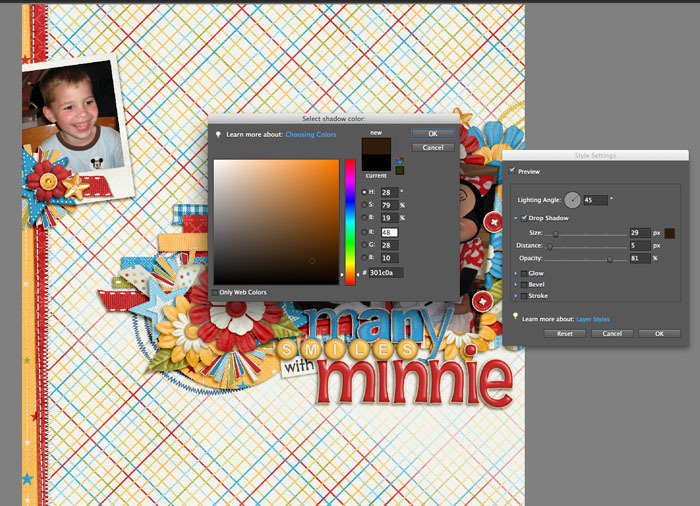 In the side layers palette, drag the photo mask (named Shape 4) down one position to be under the frame. You can actually see the outline of the photo mask under the frame, just to be sure you have it the correct size. 24. Link the photo mask and the frame layers. In the layers palette, have both the frame and the photo mask selected by clicking one of them, and then while holding down your keyboard’s Control key (Mac: Command key), click the second one. 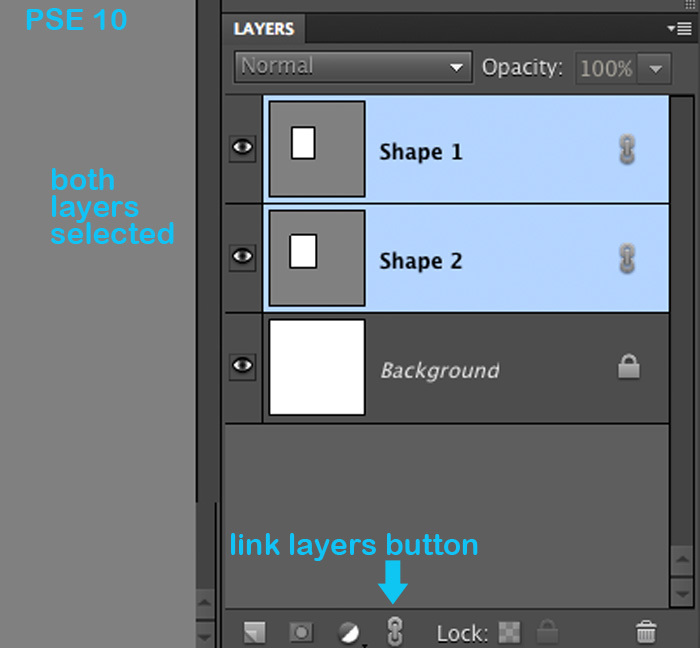 Then, click the Link button at the bottom of your layers palette. This makes the two layers move together. Click the frame layer in your layers palette to continue. 25. 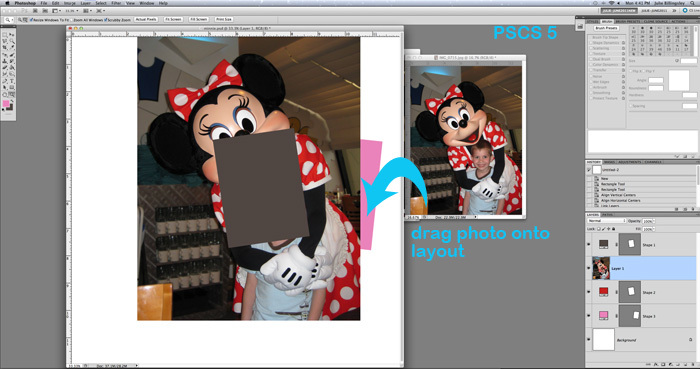 Resize the frame and photo mask. Select the Move tool (the arrow tool) if it is not already selected. This frame is bigger than I want for my layout, so we will make it smaller by clicking at the corner of the frame to open the adjustment tool. In PSE, make sure Constrain Proportions is checked and then click in one of the width/height percentage boxes. I’ve typed in 85 on my keyboard to reduce the frame+photo mask down to 85%. 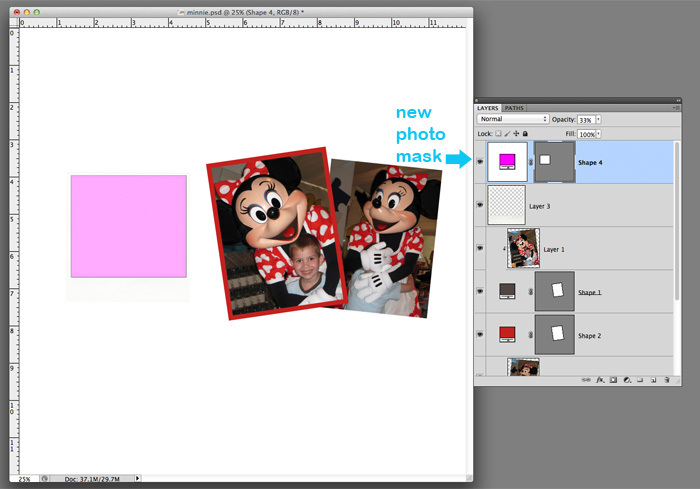 Even though we are working on the frame, the photo mask will adjust size with it because we linked them together in Step 24. Click the checkmark when the size is right. 26. Move the photo frame into the location you want it on the layout. Click the frame and drag it. I want my frame to be hanging off the layout, so you will see that part of it disappears off the visible edge. 27. 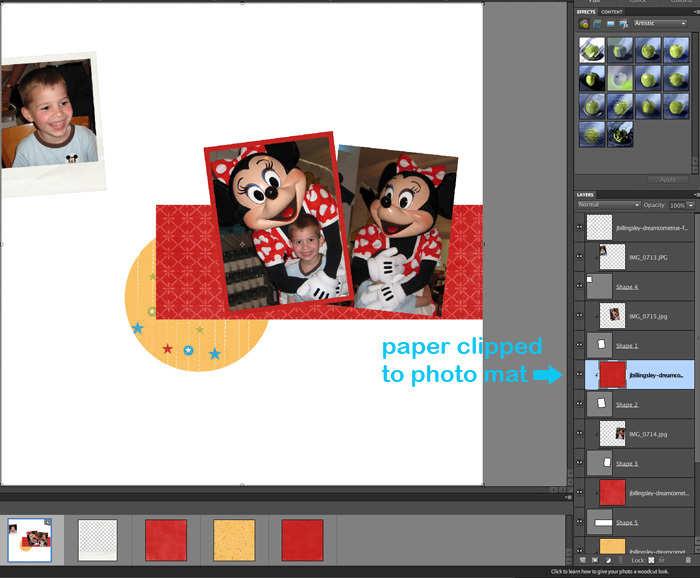 Clip the third photo to the other photo box by selecting the photo box in your layers palette (it’s labeled Shape 4 on my layout). Follow Steps 13-17. 28. Save your layout. 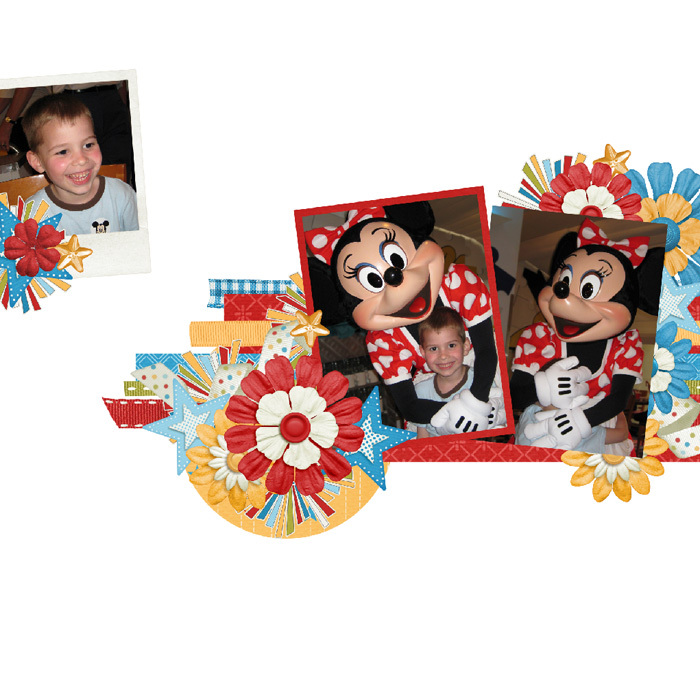 We are now done putting photos on our layout! 29. 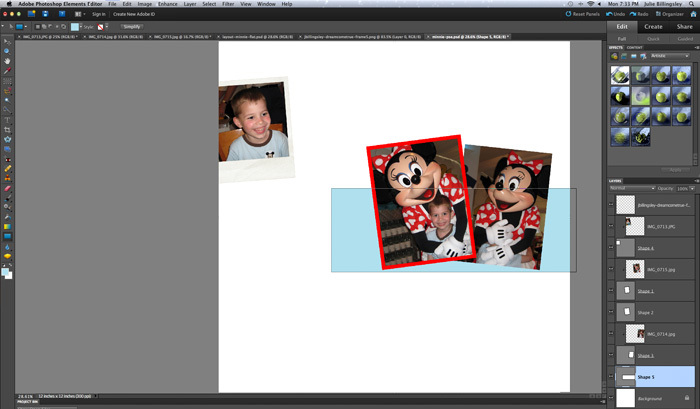 Add a clipping mask for a strip of paper. In the layers palette, click the background layer. 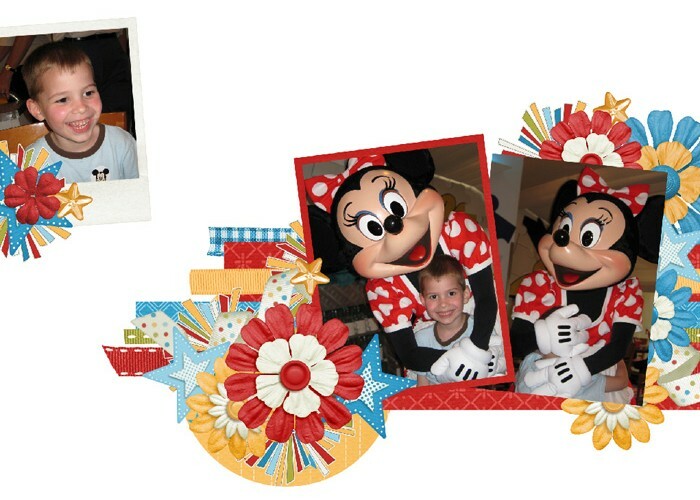 I want this paper strip under the photos. Select the Shapes tool and click the rectangle. 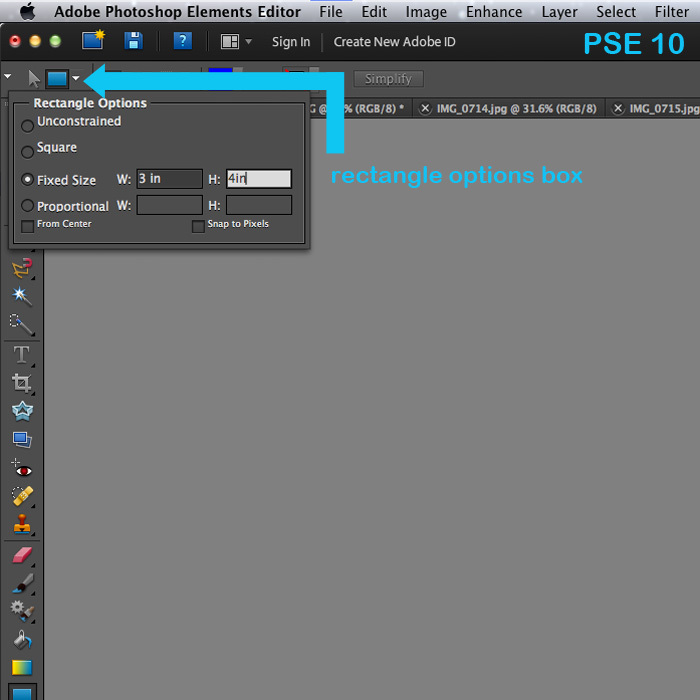 In PSE go to the blue rectangle drop down box on the left and click unconstrained size. In PSCS go the drop down box arrow which is to the right of the blob shape and click unconstrained size. Click on the layout and drag out to the size you desire. I want my paper going off the edge of the layout. This paper strip has been named Shape 5. 30. Open a paper for the paper strip. 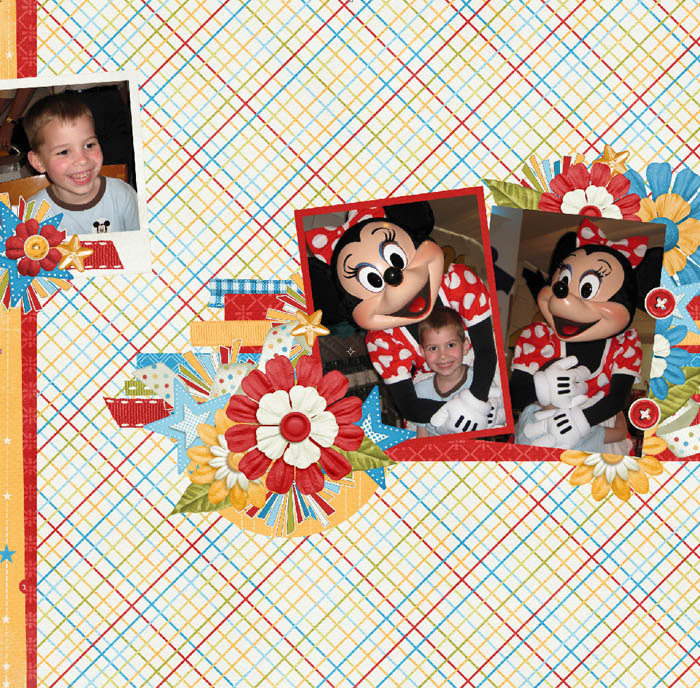 In your program, go to File-Open and then navigate to your digital scrapbooking kit. Select a paper and open it. In PSE, the newly opened paper will be front and center in your workspace. Select the layout from the bottom Project Bin and drag it onto the gray background so it is open in the workspace. Important tip: when you drag the paper onto the layout, press and hold the shift key on your keyboard. This will keep the paper centered on the layout. Now click and drag the paper from the bottom Project Bin onto the layout while holding the shift key down. In PSCS, click the newly opened paper and drag it onto the layout while holding down the shift key. 31. 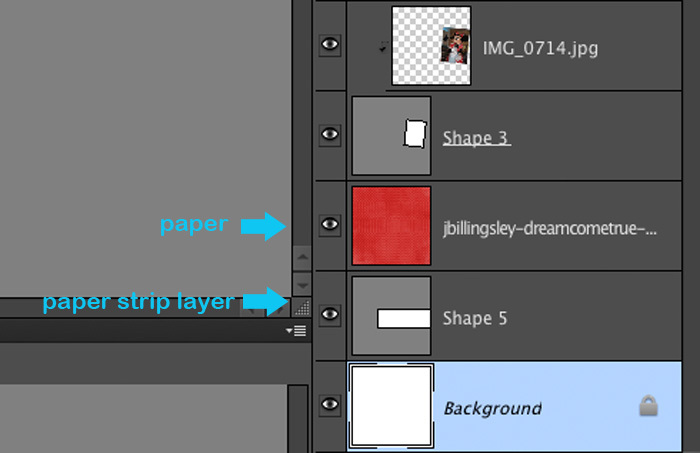 Move the paper above the rectangle for the paper strip layer (Shape 5) in the layers palette. 32. Clip the paper to the paper strip mask. In PSE, press Control-G on your keyboard (Command-G on a Mac). In PSCS, to clip the paper press Control-Alt-G on your keyboard (Option-Command-G on a Mac). 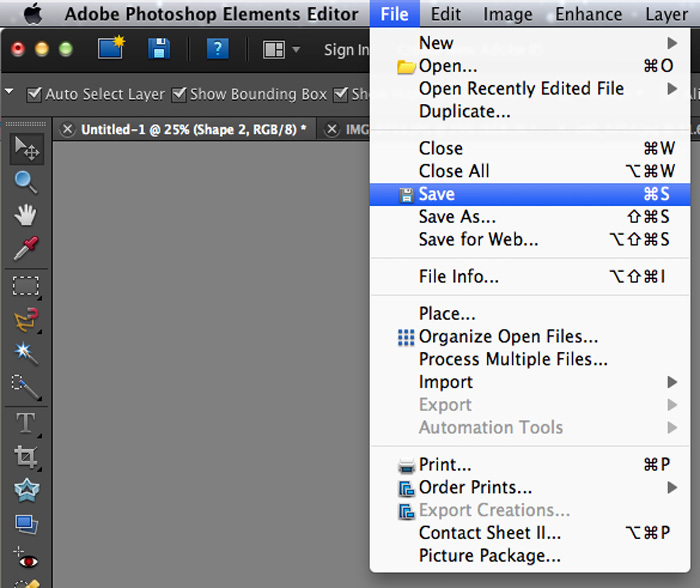 If you don’t like to use the keyboard shortcuts, you can go to Layer-Create Clipping Mask in either program. The paper is now clipped to the size of the paper box mask we created. 33. 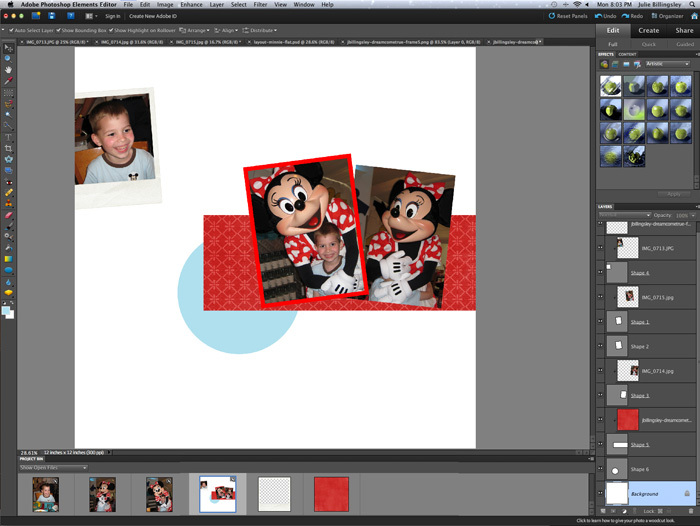 Add a clipping mask for a circle of paper. In the layers palette, click the background layer. I want this circle under the photos and other paper. 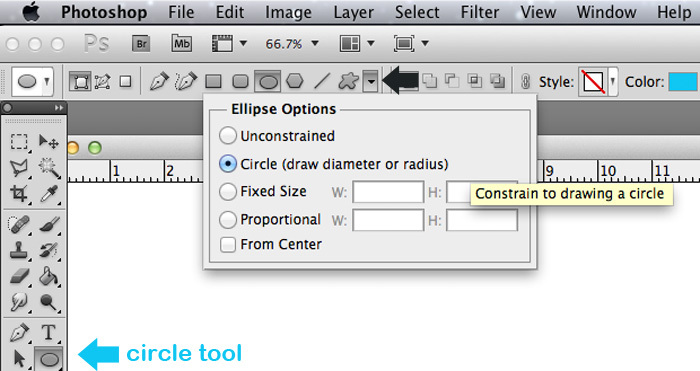 Select the Shapes tool and click the circle. In PSE go to the blue circle drop down box on the left and click circle. In PSCS go the drop down box arrow which is to the right of the blob shape and click circle. This makes sure it’s a round circle and not an oval. Click on the layout and drag out to the size you desire. This circle has been named Shape 6. 34. Open a paper for the paper circle, following the instructions in Step 30. 35. 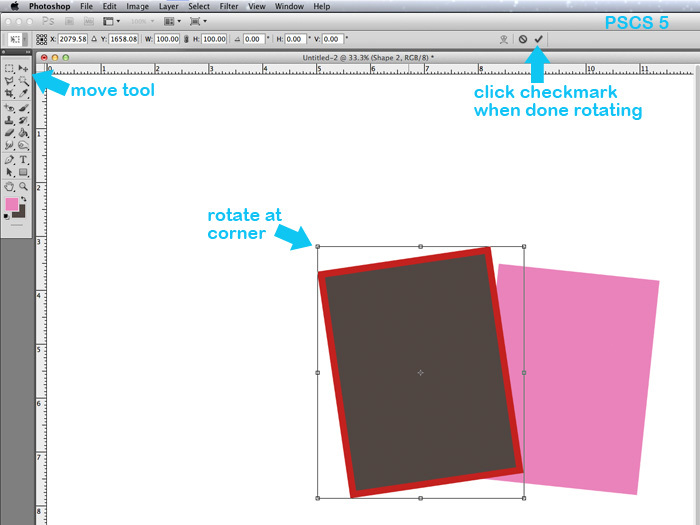 Move the paper above the circle for the paper circle layer (Shape 6) in the layers palette. 36. Clip the paper to the paper circle mask. In PSE, press Control-G on your keyboard (Command-G on a Mac). In PSCS, to clip the paper press Control-Alt-G on your keyboard (Option-Command-G on a Mac). If you don’t like to use the keyboard shortcuts, you can go to Layer-Create Clipping Mask in either program. The paper is now clipped to the size of the paper circle mask we created. 38. Open a paper for the photo mat, following the instructions in Step 30. I selected a solid red paper. 39. 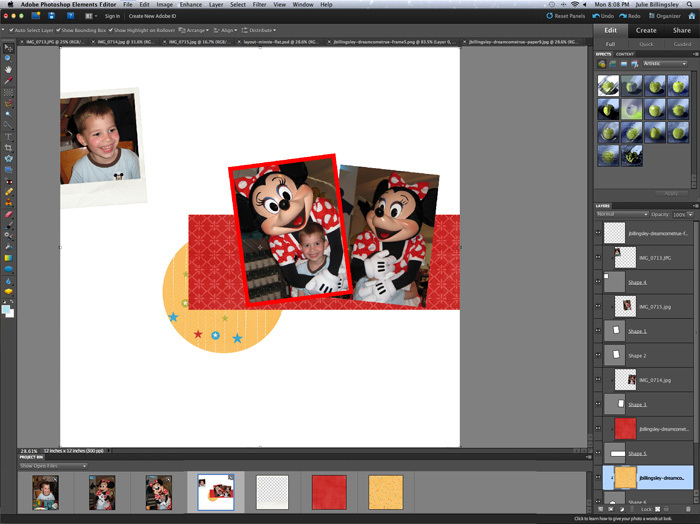 Move the paper above the photo mat rectangle (Shape 2) in the layers palette. 40. Clip the paper to the photo mat. In PSE, press Control-G on your keyboard (Command-G on a Mac). In PSCS, to clip the paper press Control-Alt-G on your keyboard. (Option-Command-G on a Mac). 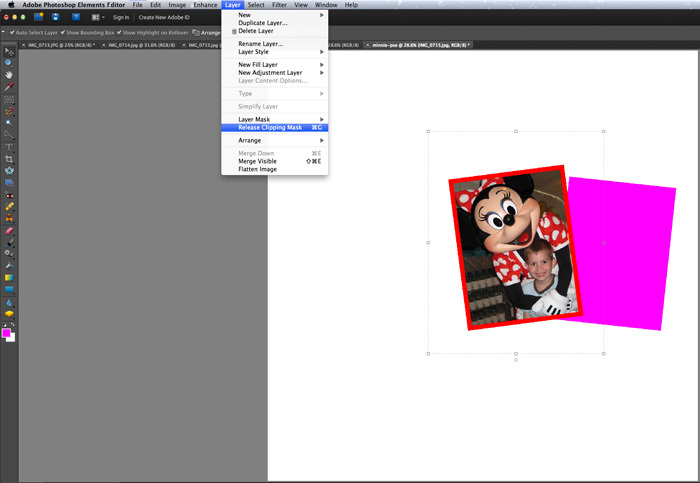 If you don’t like to use the keyboard shortcuts, you can go to Layer-Create Clipping Mask in either program. The paper is now clipped to the size of the photo mat mask we created. 41. Open some elements to put on your layout. 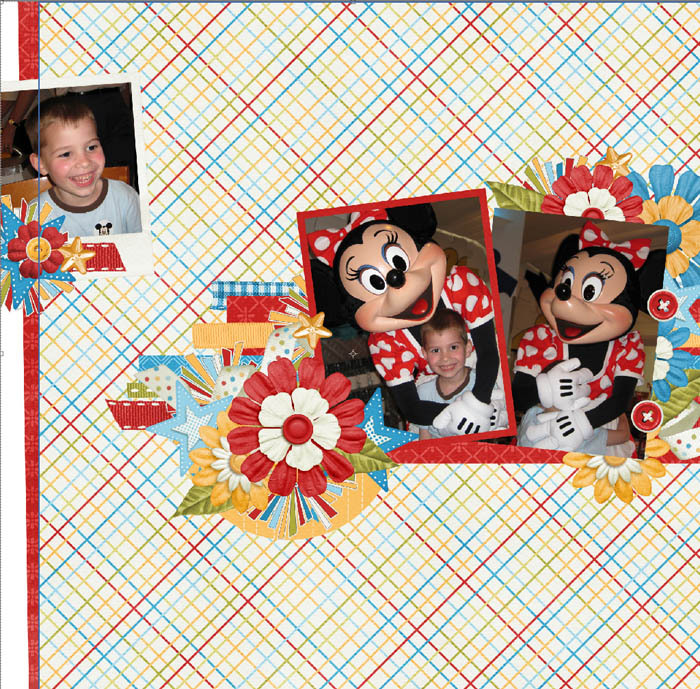 In your program, go to File-Open and then navigate to your digital scrapbooking kit’s elements folder. Instead of opening one at a time, on a PC hold down the Control key on your keyboard (on a Mac hold down the Command key) while you select several elements. I selected 5 flowers. Click open and they will all open in your program. In PSE, they will appear in the Project Bin and the last one opened will be front and center in your workspace. At some point, your Project Bin will become full and it will start a second layer. Just scroll down in the bin to see all your items. 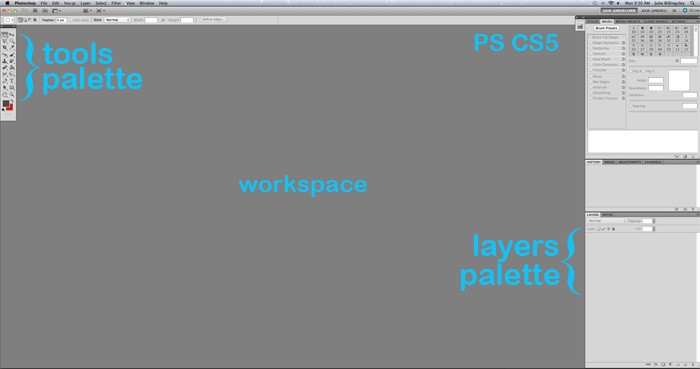 In PSE, click on your layout and drag it into the gray empty workspace so it is active. 42. Drag a flower (or other element) onto your layout. 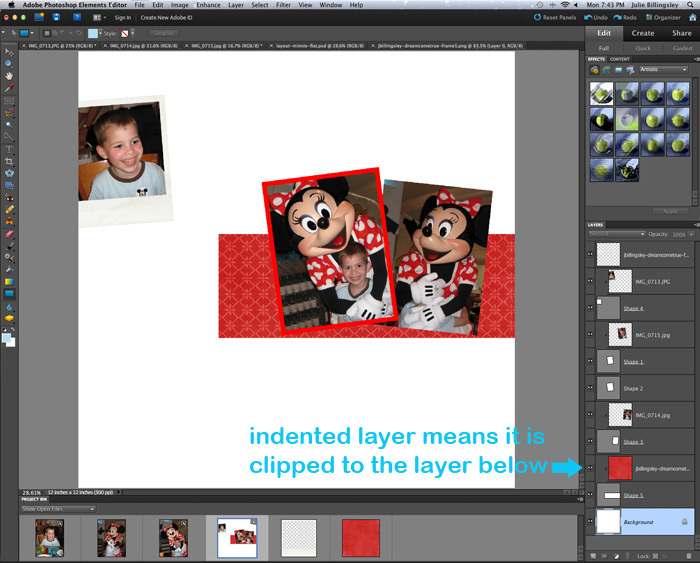 Move it up or down in your layers palette, layering it above or below the other items on your layout. I have put a flower on and made it the top layer. Do not be afraid of layering elements over the unimportant part of a photo. It adds visual interest and can disguise unsightly parts of a photo. For example, my red flower hides some of the cups that are in the back of the picture. 43. Resize the element the same way as in Step 15. Make sure to keep the size constrained or the elements will become misshapen. 44. Duplicate the flower. 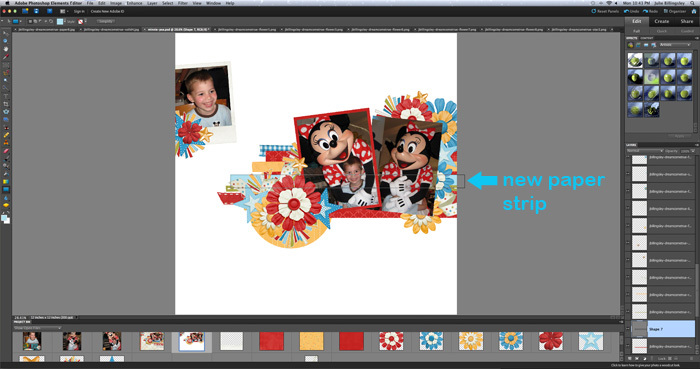 Be sure the flower is selected in the layers palette and go to Layer-Duplicate. The keyboard shortcuts for duplicating a layer are Control-J on a PC and Command-J on a Mac. 45. Arrange the second red flower and move it under a picture so it is just peeking out. You will need to click and drag the flower in the layers palette until it is below the picture. Resize the element if desired. I also recommend turning the flower so it looks a bit different than the first. This will add visual interest and make it look more realistic. 47. Drag a flower (or other element) onto your layout. Move it up or down, layering it above or below the other items on your layout. I have added a blue and yellow flower. I am clustering it below the red flower, and it is hanging off the side edge. 48. Repeat Step 47, remembering to change the angle or size if desired. 49. Open some more elements to put on your layout. 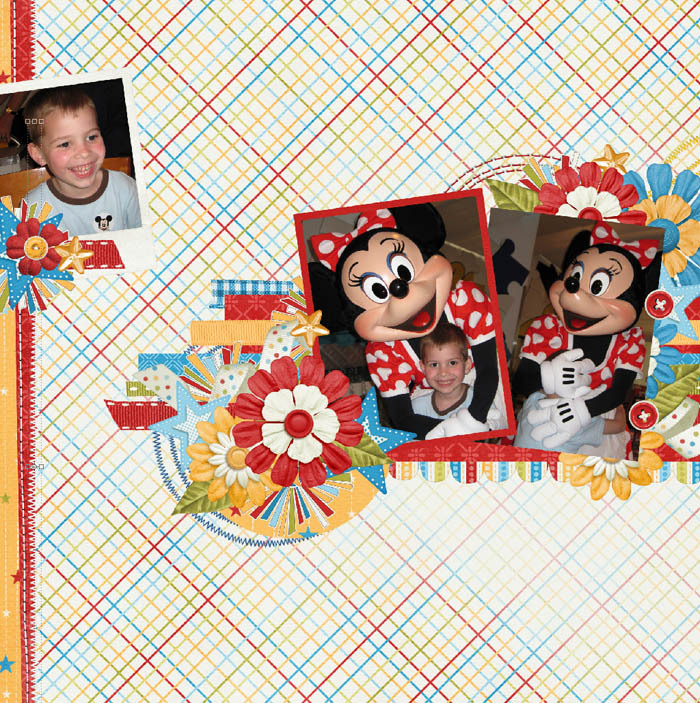 In your program, go to File-Open and then navigate to your digital scrapbooking kit’s elements folder. Instead of opening one at a time, on a PC hold down the Control key on your keyboard (on a Mac hold down the Command key) while you select several elements. I selected a few stars and the starburst. 50. 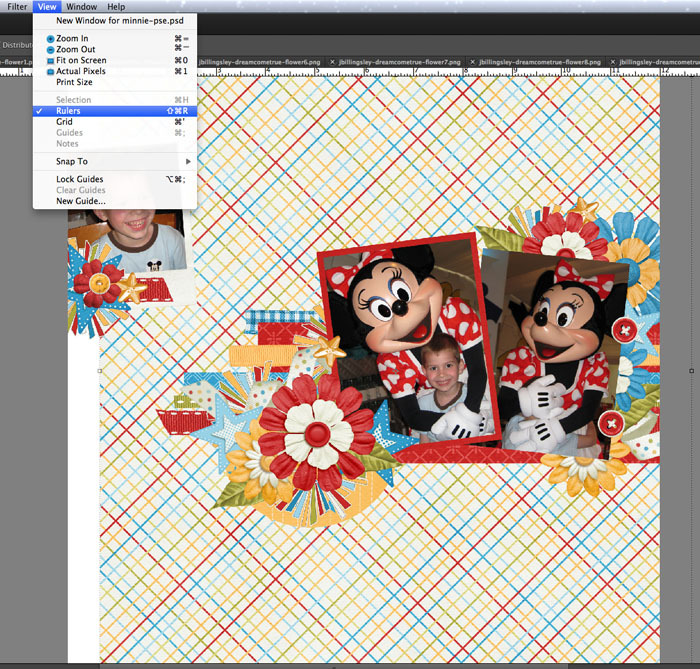 Drag each item onto your layout and arrange, resize, and angle the elements as needed. 51. Open some ribbons to put on your layout. I like to use a variety of ribbons so I am placing 4 flat ribbons on my layout. 52. Drag a curled or loopy ribbon to the layout. This type of element looks good tucked in and around other elements. 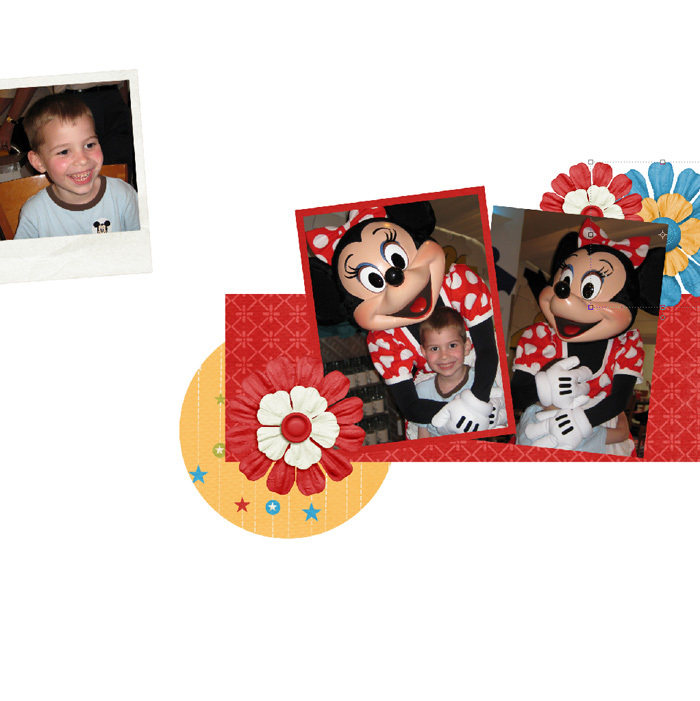 I add it to one side of my photos and duplicate the ribbon. I rotate the ribbon around until it gives the look I want. 54. 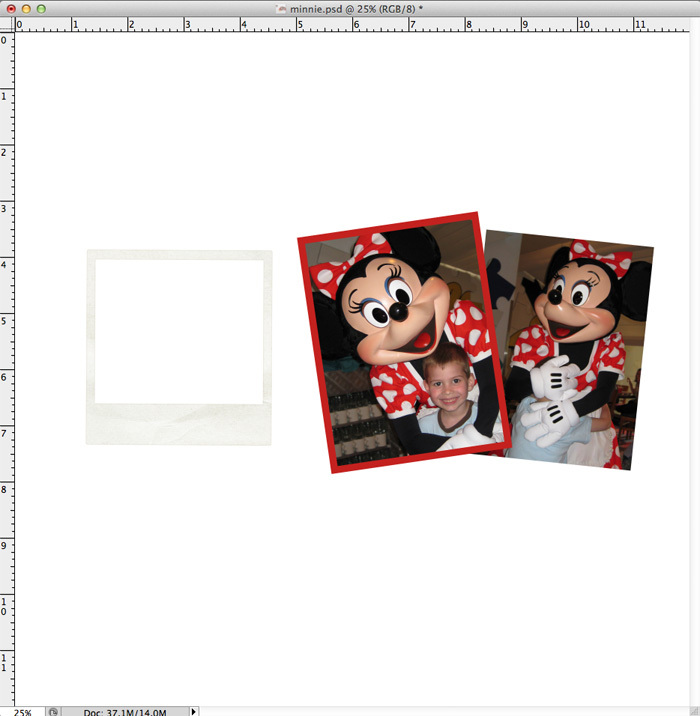 Add a new paper strip following Step 29. 55. Cover the paper strip mask with paper following Steps 30-32. 56. Open and place leaves or other elements in and around your element clusters. 57. Open and add buttons to your layout. Be sure to angle any duplicate buttons a little so they look more realistic. My element clusters are looking nice and full, so it’s time to add the background. 58. Open a paper for your main background. 59. 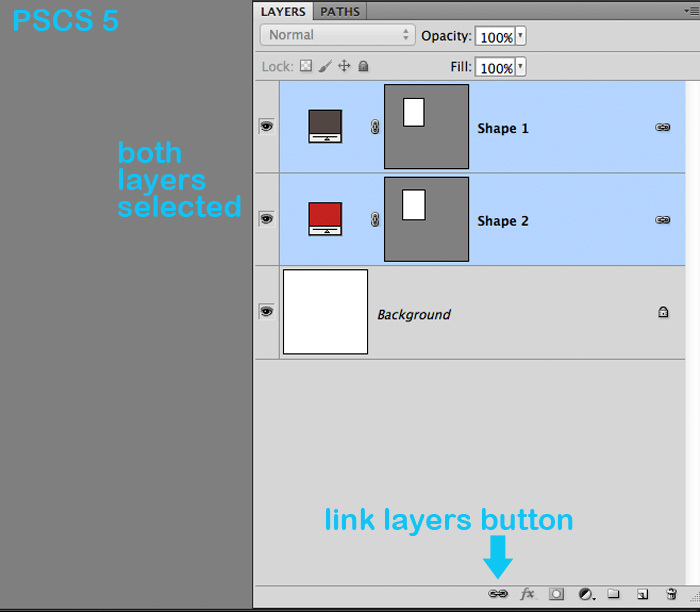 Select the white background of your layout in the layers palette. 60. Drag the paper onto your layout, remembering to hold the shift key on your keyboard so the paper is centered on your layout. 61. Use your keyboard’s arrow keys and nudge the paper to the right just over a half inch. If you don’t see your rulers, go to View-Rulers, and rulers will appear at the top and side of your layout. 63. 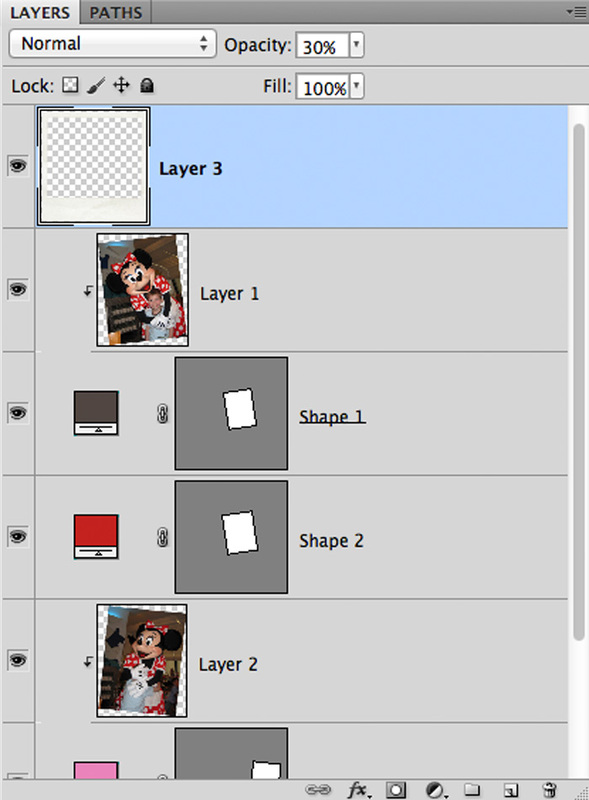 Select the white background of your layout in the layers palette. 64. Add a new paper strip following Steps 29-32. Be sure your paper reaches all the way from the top to the bottom of the layout. Select your Move Tool (Arrow) and use your arrow keys on your keyboard if you need to nudge your paper strip up or down. 65. Angle your paper strip, using the technique in Step 16. 66. Clip the paper to the paper strip, using the techniques in Steps 30-32. 67. 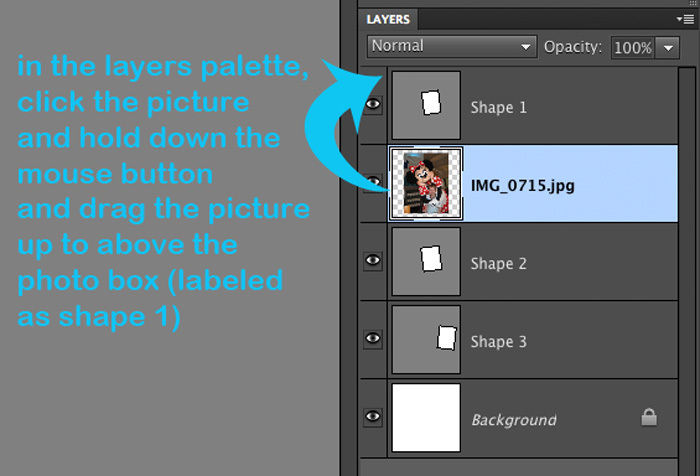 Select the white background of your layout in the layers palette. 68. Drag the final background paper onto your layout, remembering to hold the shift key on your keyboard so the paper is centered on your layout. 70. Add additional elements like stitching and paint. I’ve used Traci Reed’s Blissful Stitches Curved and Blissful Stitches Straight. I’ve also used Julie Billingsley’s Paint Wash in the background to let the journaling be visible against the background. 71. Decide on a title and consider that great titlework often uses more than one alpha. I’ve used three alphas from Julie Billingsley. The red word is from the Dreams Come True kit, the yellow word is from Color Spectrum Alpha, and the blue word is from Art and Soul Bolds Alpha. 72. Make a small journal strip by using the rectangle tool and clipping a piece of paper to it like we’ve done with the paper strips previously. 73. Add the word “with” to the journal strip by using the Text tool. 74. Shadow the papers and elements. See the tutorial on shadowing for tips on how to get realistic shadows and achieve the look you want. 75. Add journaling to the layout. Be sure your journal layer is under the embellishment layers or you could accidentally write over a flower or other element. 76. Save your layout! You are done! Congratulations! You’ve finished a layout! These steps will create an endless number of layouts! As you continue to scrapbook, these steps will become easy, and you will enjoy the process more and more. Let your creativity reign and get scrapping! Fantaastic tutorial!!! Thank you so much. I had so much information but it was hard the first time to put it all together to come up with an actual layout. I really appreciated the good instructions and wonderful pictures to illustrate. Thank you! I am very much a beginner and find PSE not intuitive. Maybe its because I think in terms of the Microsoft Office programs and how they work. 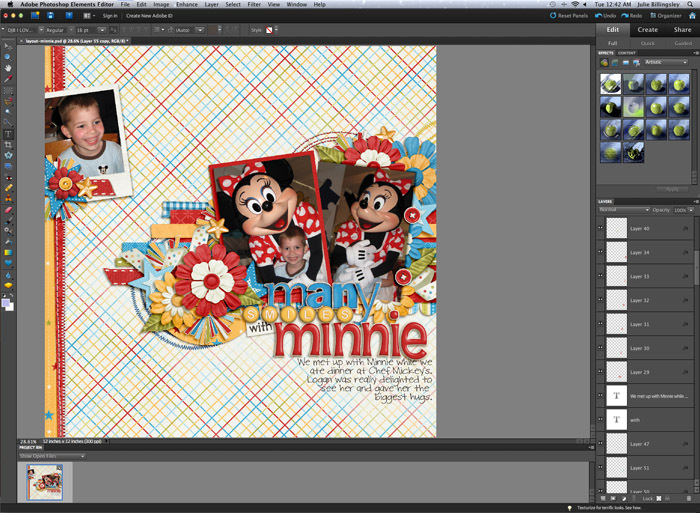 Anyway, I am trying to follow your tutorial and my layout just doesn’t work! Is it necessary to have the rectangles and the frames? Can I just drag the photo onto the layout? I end up with just a big mess! Sorry I am completely stupid when it comes to this program! I usually use PowerPoint but am trying to learn PSE. Help! What a great tutorial! I feel like I can do anything in PSCS5 now. Thank you! It’s a lot to take in but you have really given us a fantastic step by step tutorial to get us started. Thank you. Getting Started: What Is Digiscrapping? Digital Organization: So Many Methods, So Little Time!